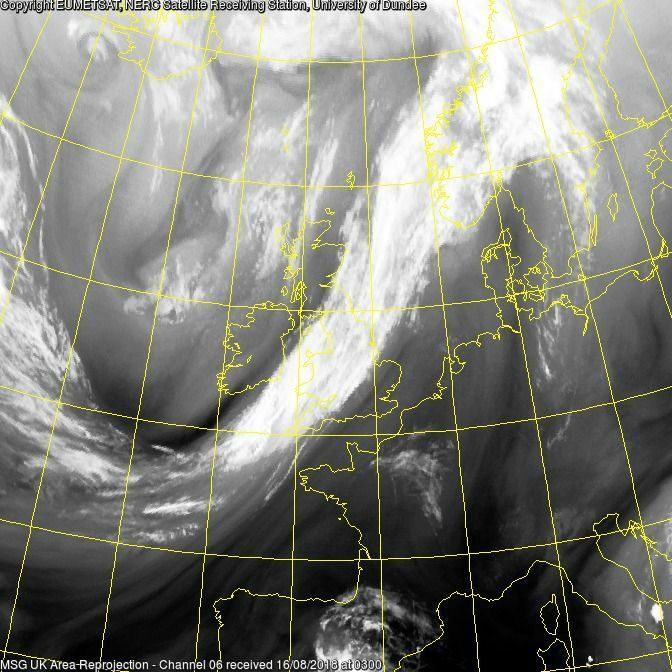 Hi Knocker, how much impact do you think these fronts/waves may have on the SW? 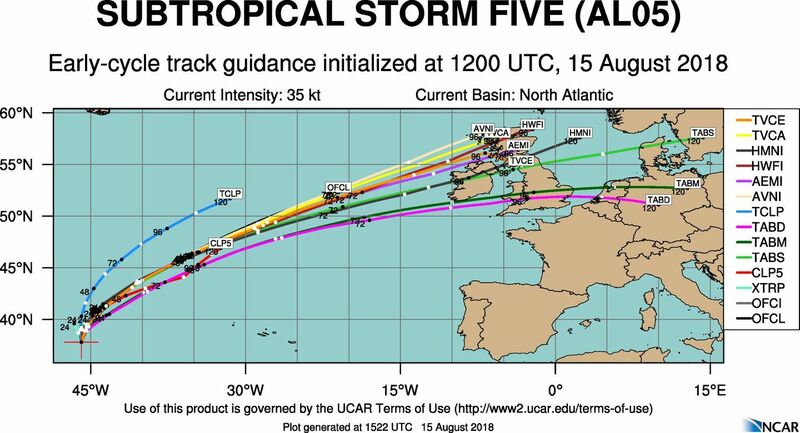 Without being definitive Andy, not that much. 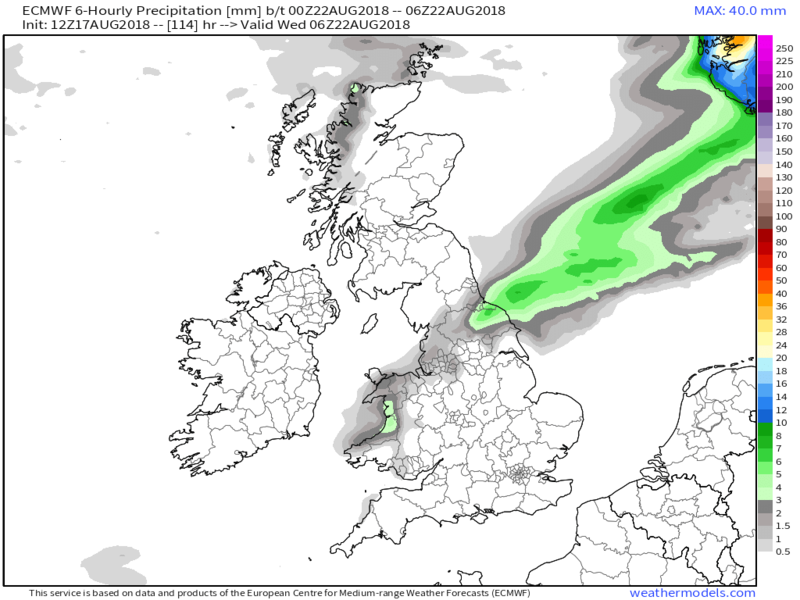 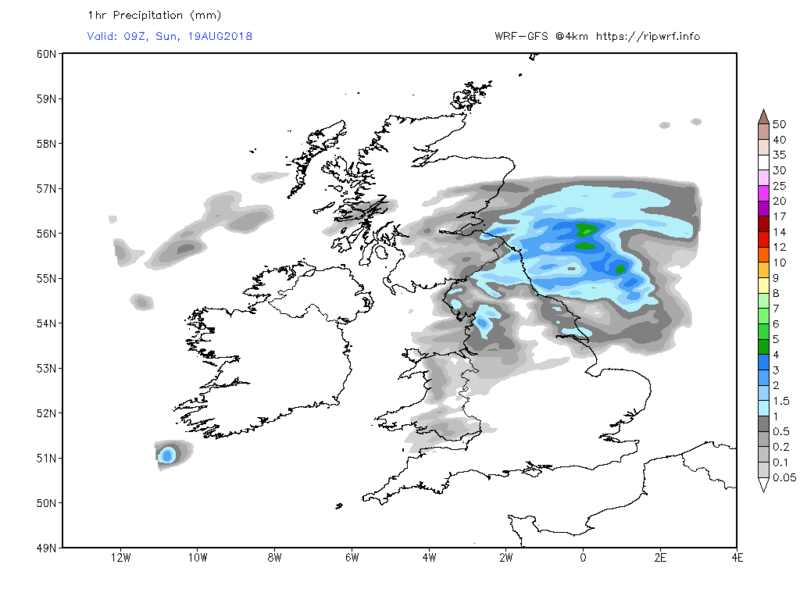 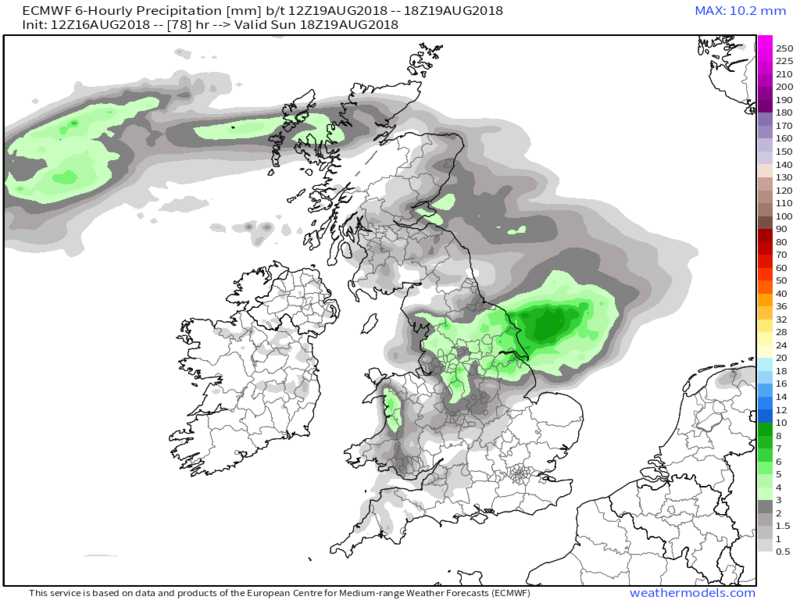 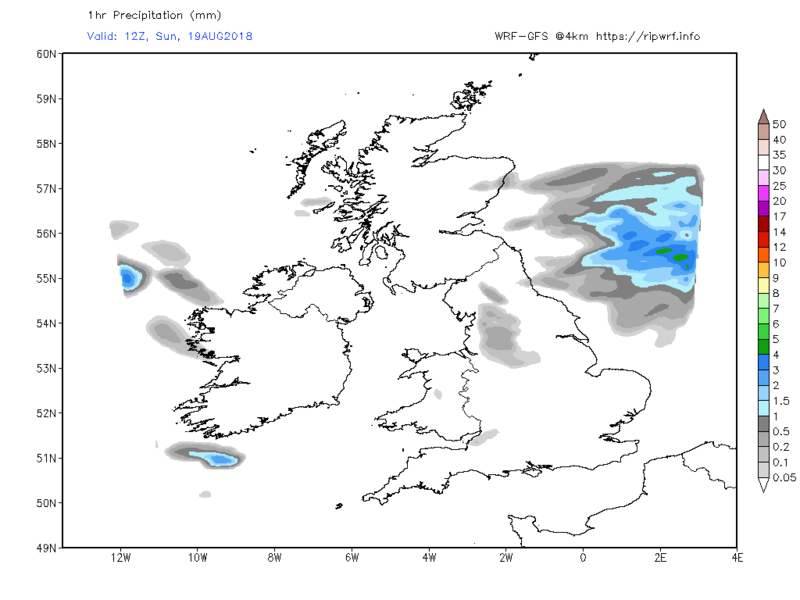 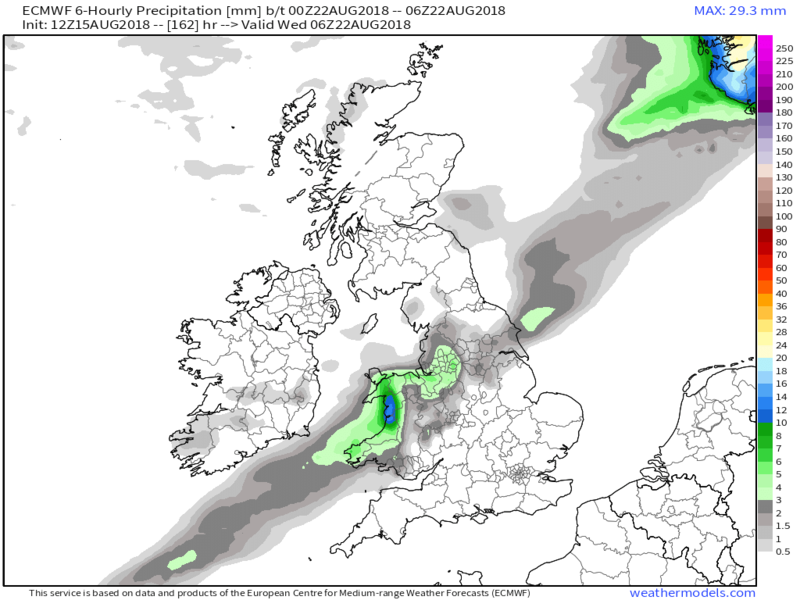 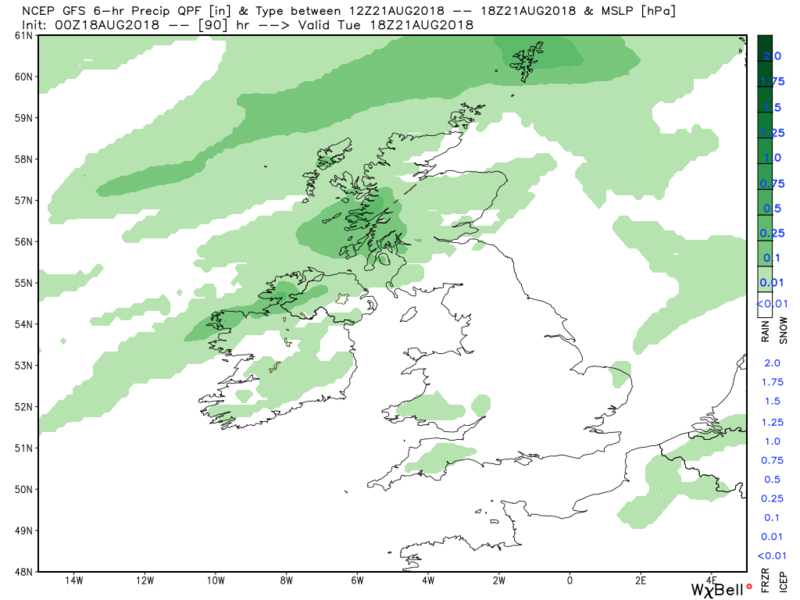 Most of the rain on Sunday will be further north according to the ecm and then fronts sinking south east against the ridge tend to fizzle out when they hit the subsiding air like next Weds, which of course is a long way off. 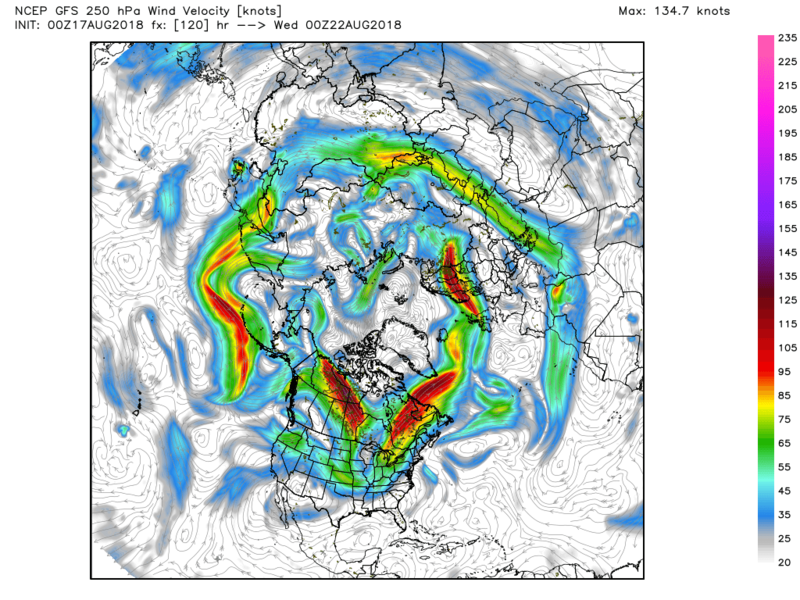 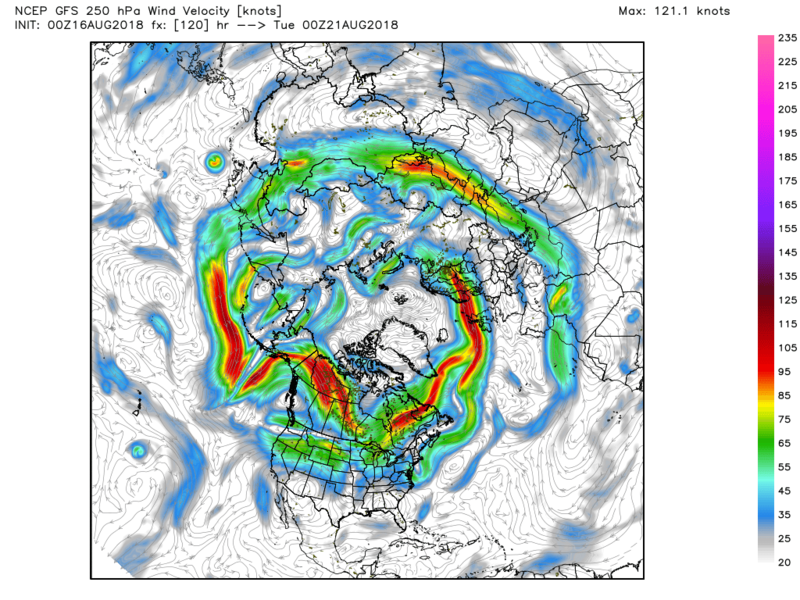 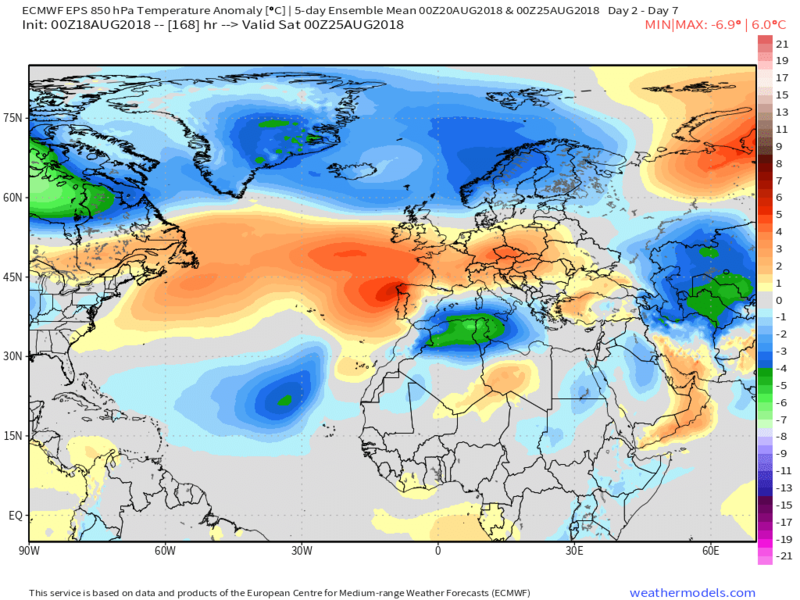 The outlook still changeable but although the dying days of TS Ernesto are fairly mundane, it’s travels across the Atlantic have pushed the jet a tad north and initiated an influx of warmer and more humid air over the UK, particularly the southern half, within the short range period. 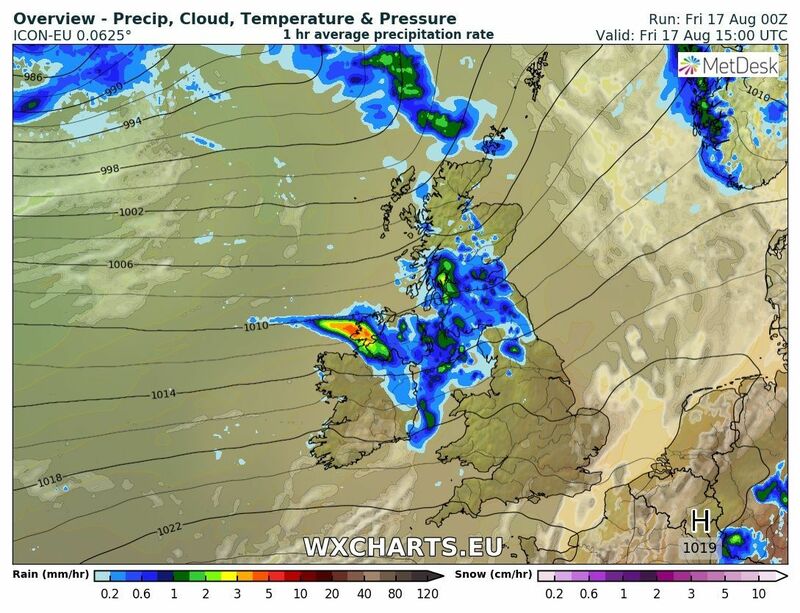 Currently the upper trough is to the north west of the UK is dominating the weather and the fronts associated with this are tracking south east across England and Wales.  The 0300 sat. 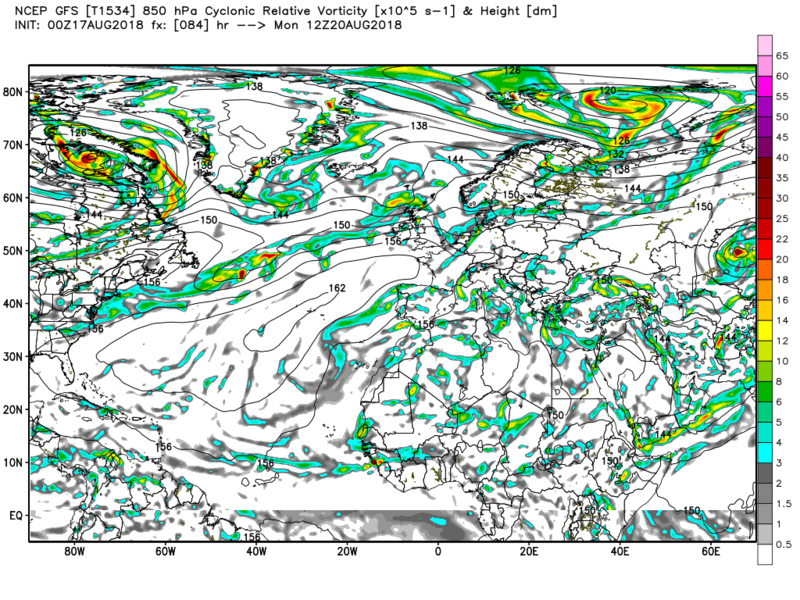 image illustrates this well. 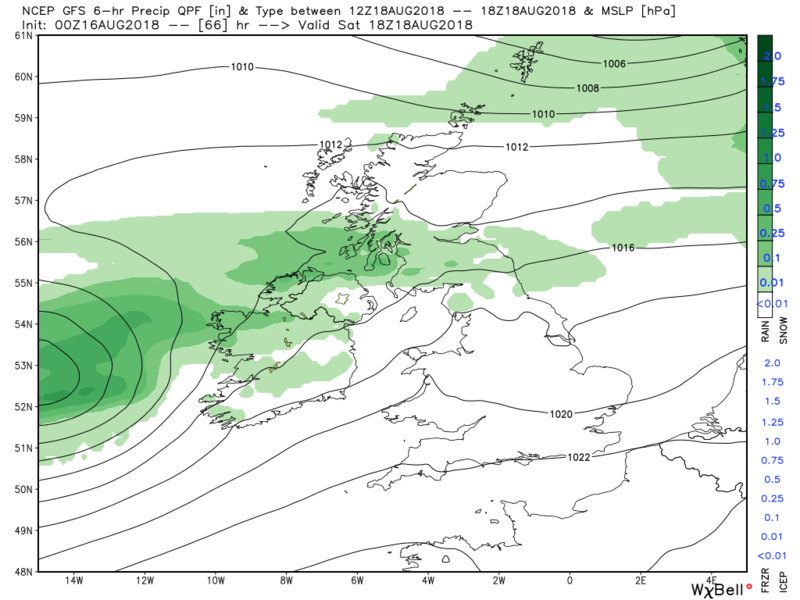 The rain belt, quite persistent and moderate for a while, will finally clear the south east by early evening, Behind the fronts cooler and unstable air producing a rash of showers, particularly in the north west and west, and longer periods of rain where they coalesce. 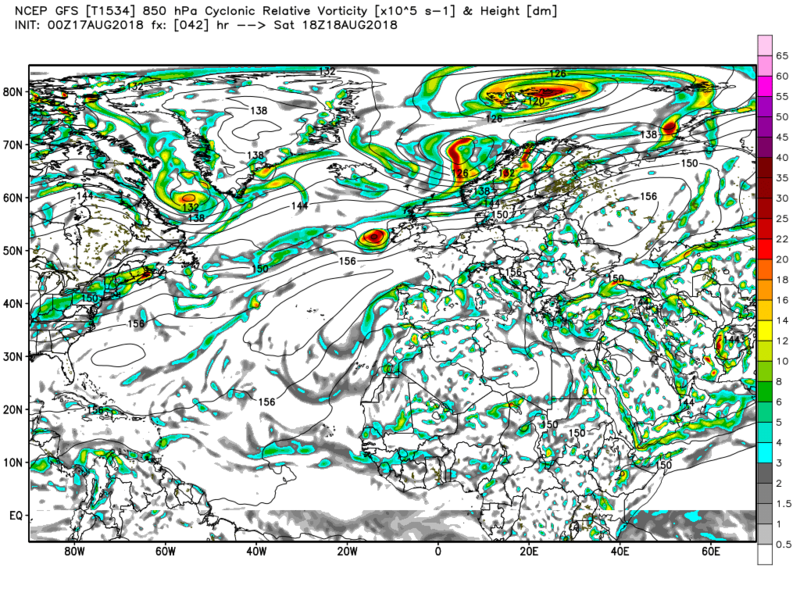 The midnight fax is a thing of beauty but just take it the fronts merge. 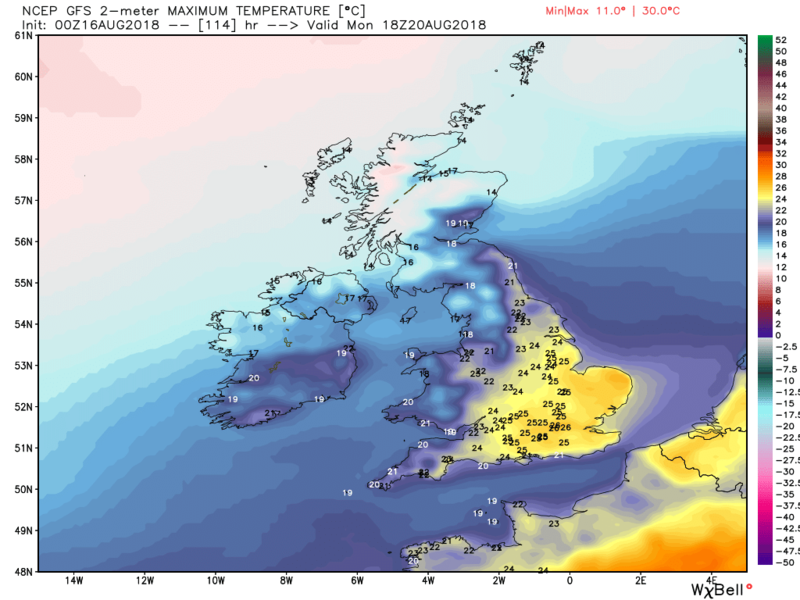 Thus much of England and Wales will be in the warm sector on Saturday thus cloudy, humid but warm where the sun breaks through but cooler with patchy rain in the north. 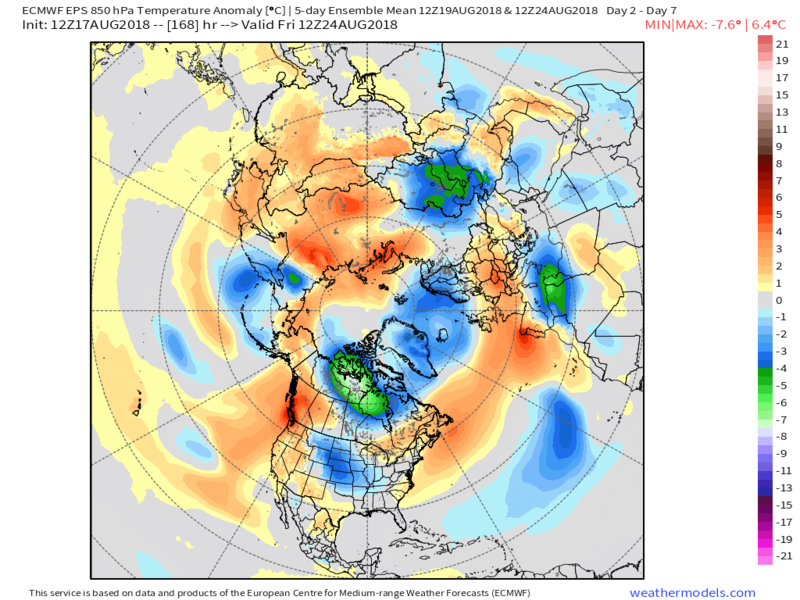 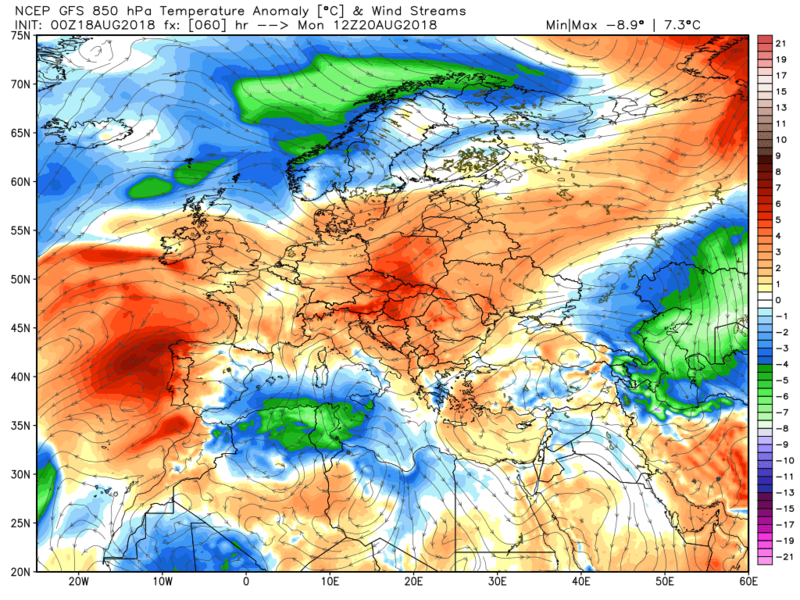 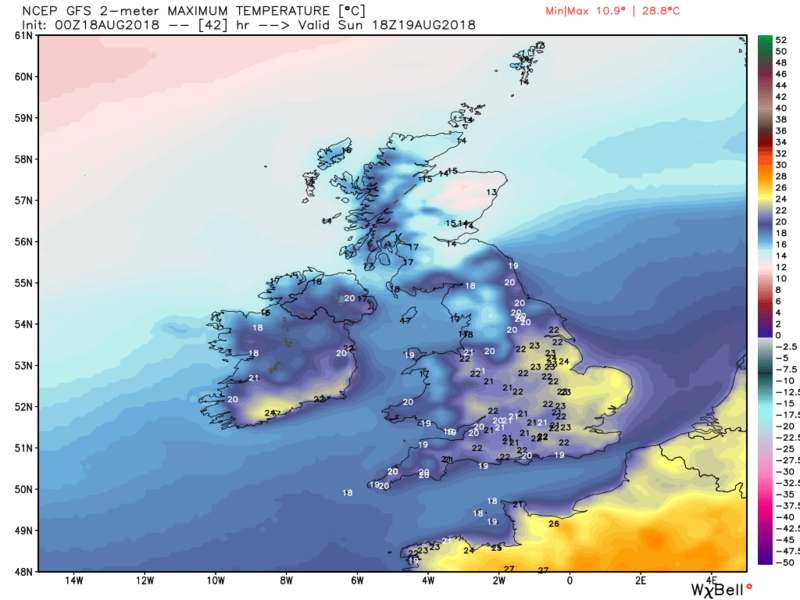 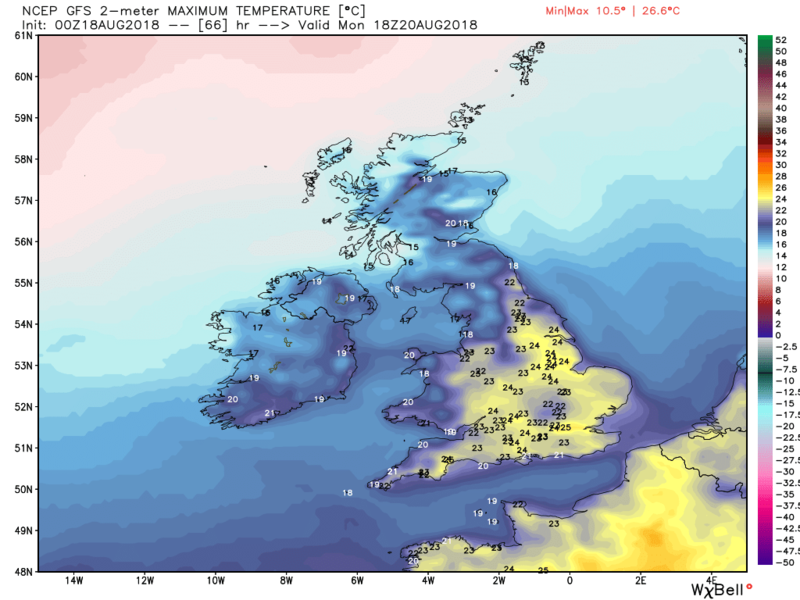 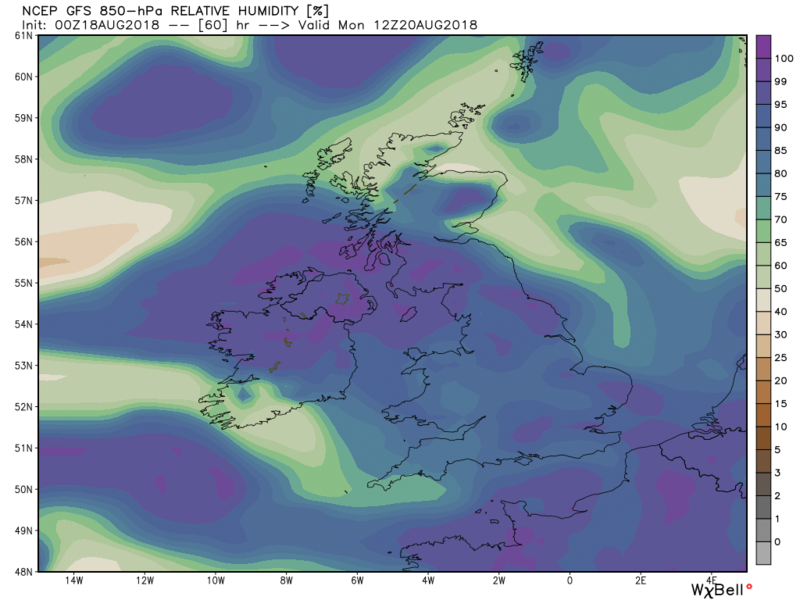 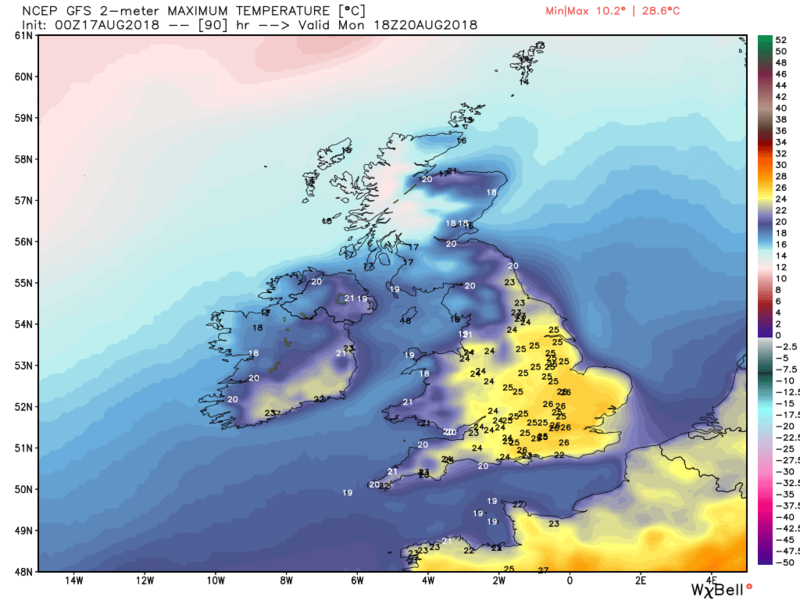 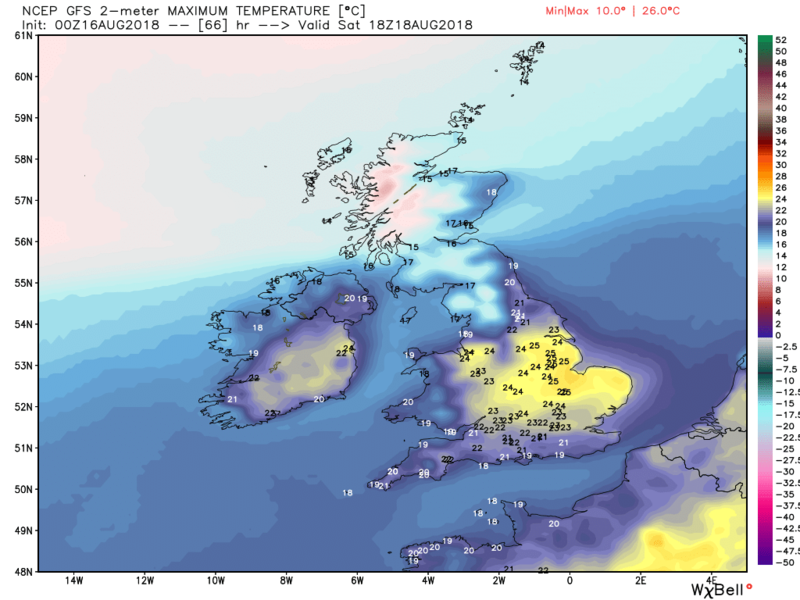 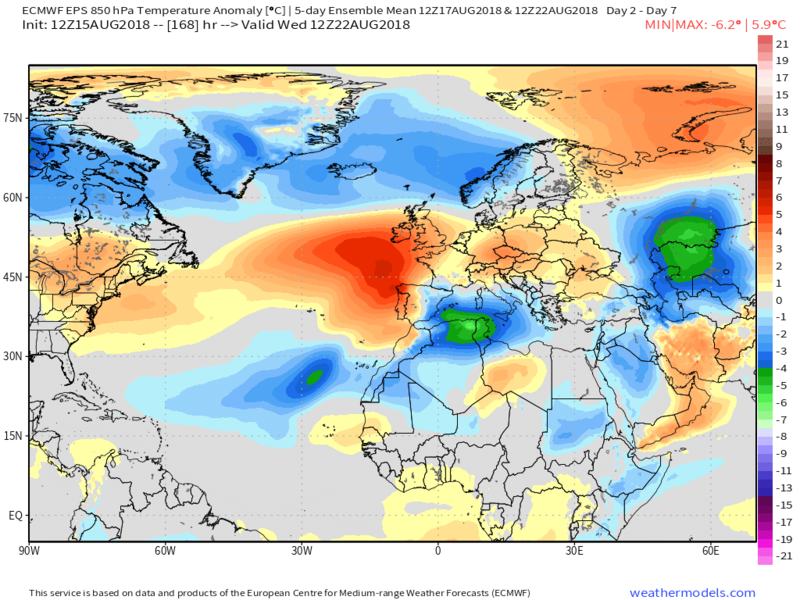 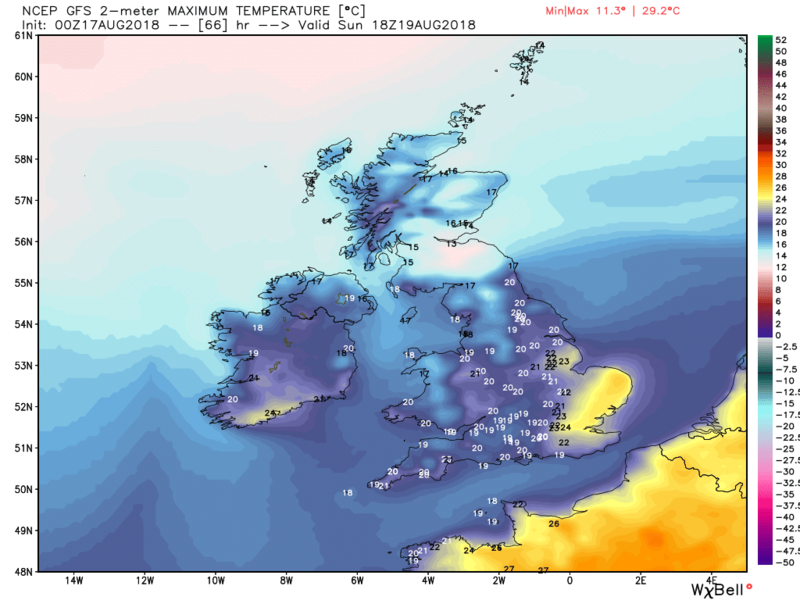 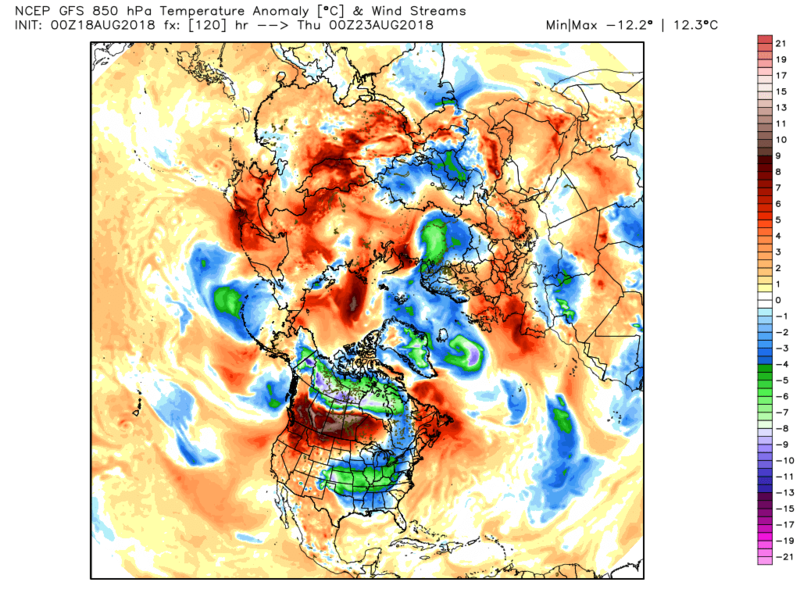 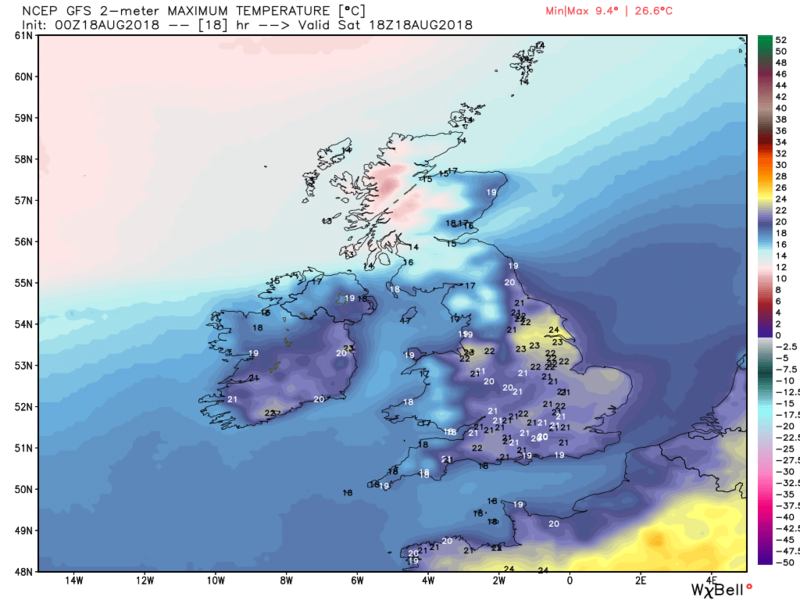 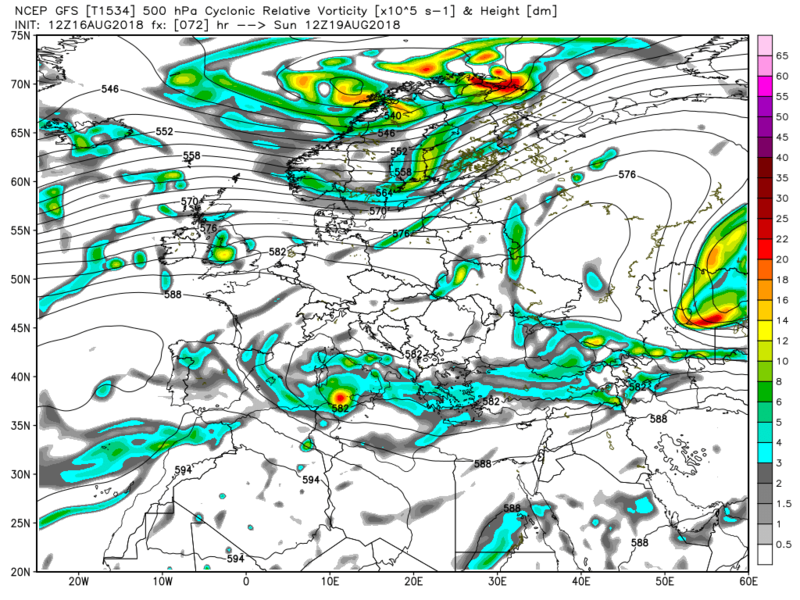 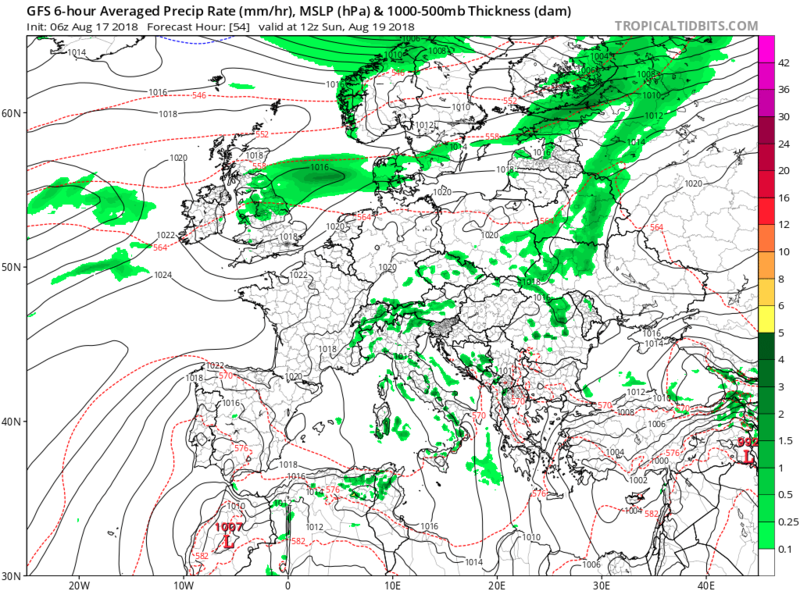 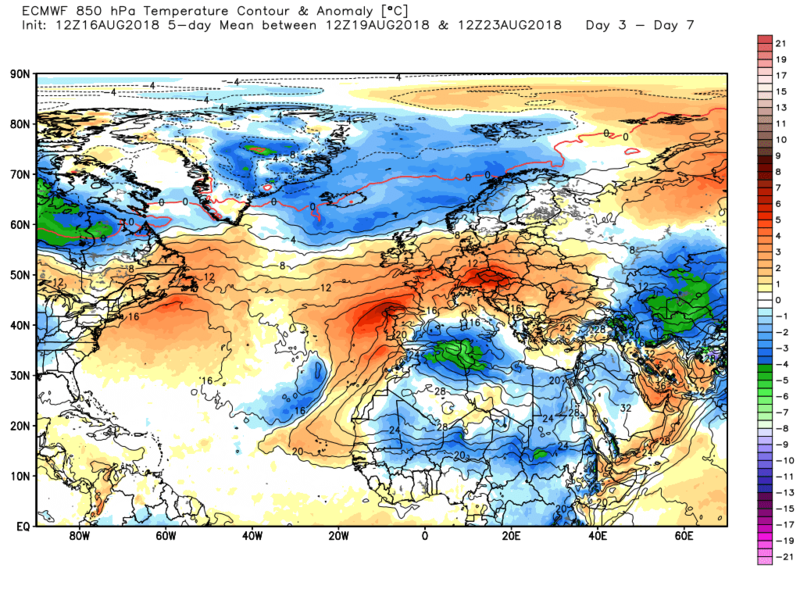 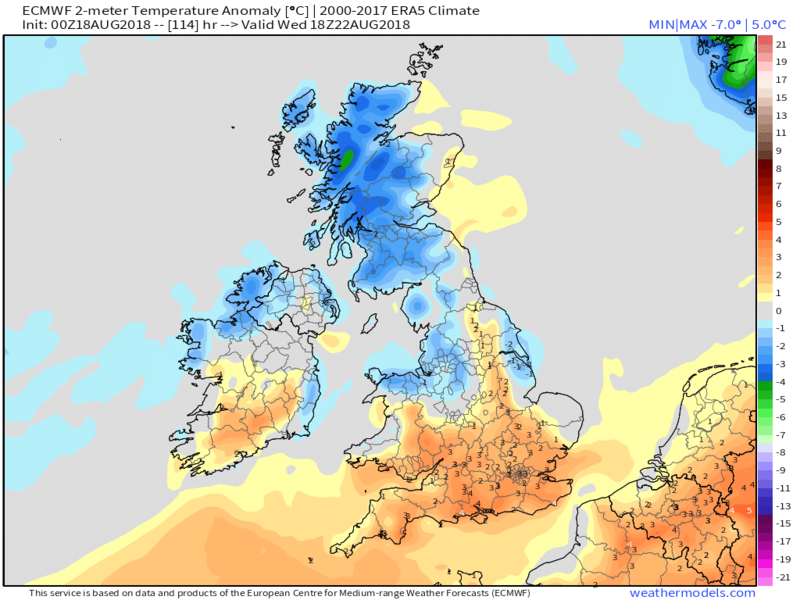 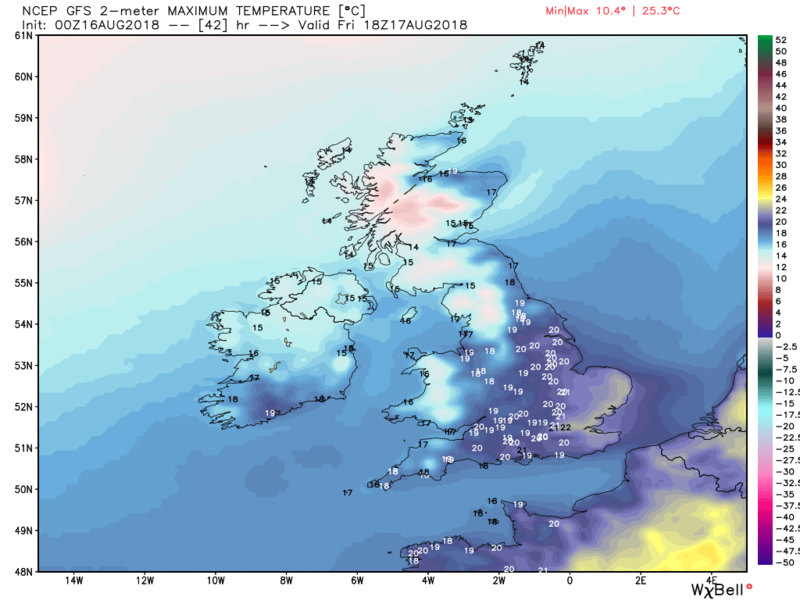 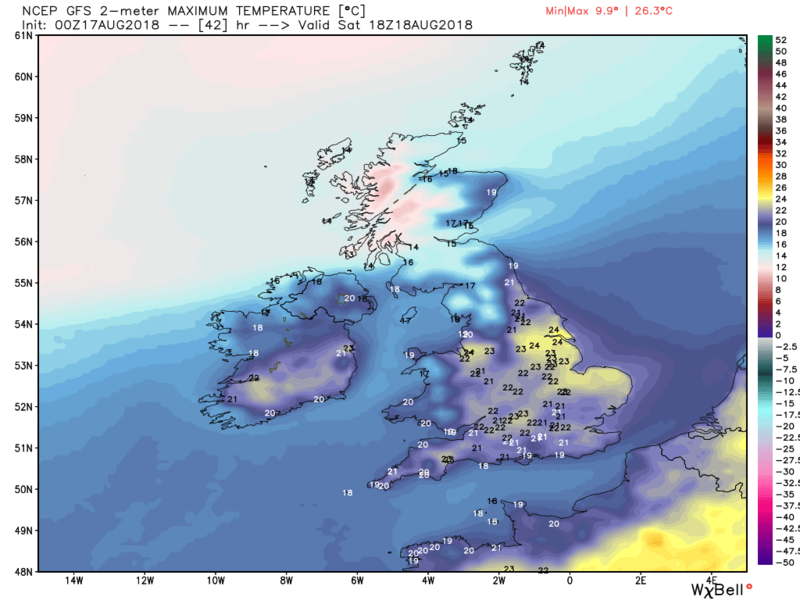 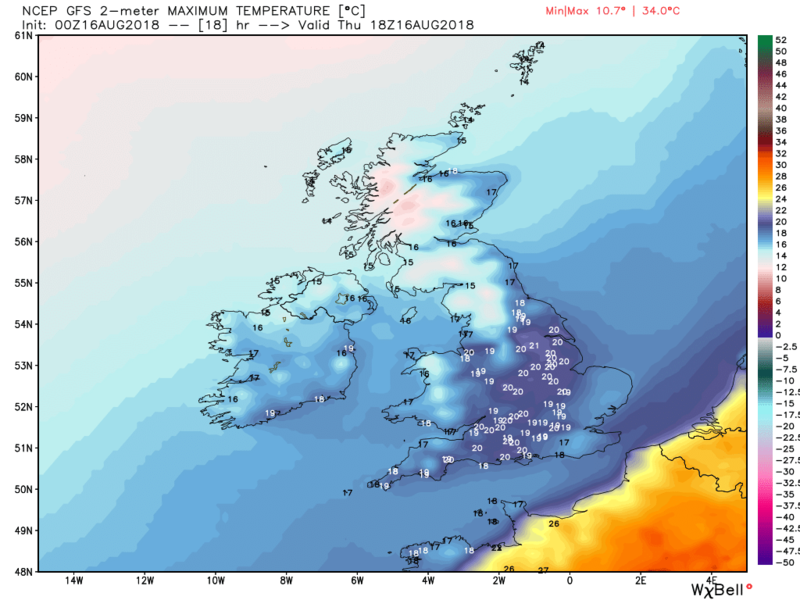 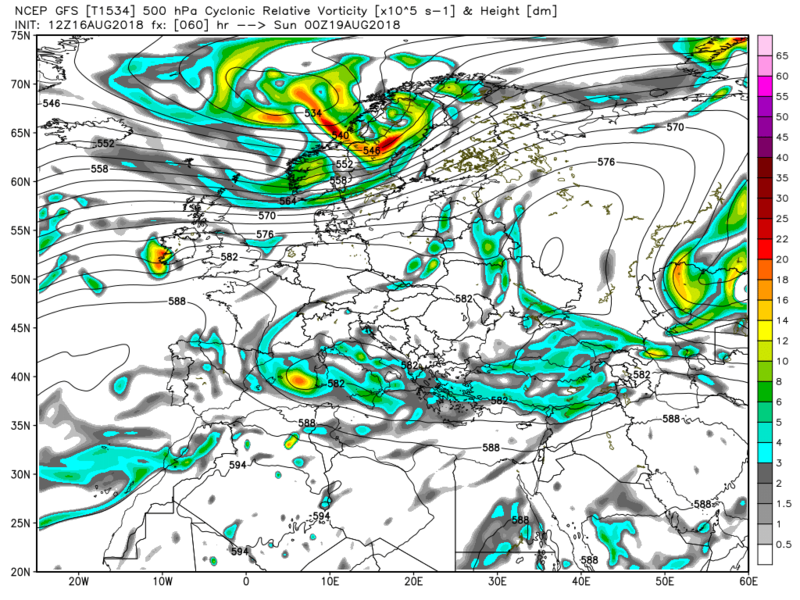 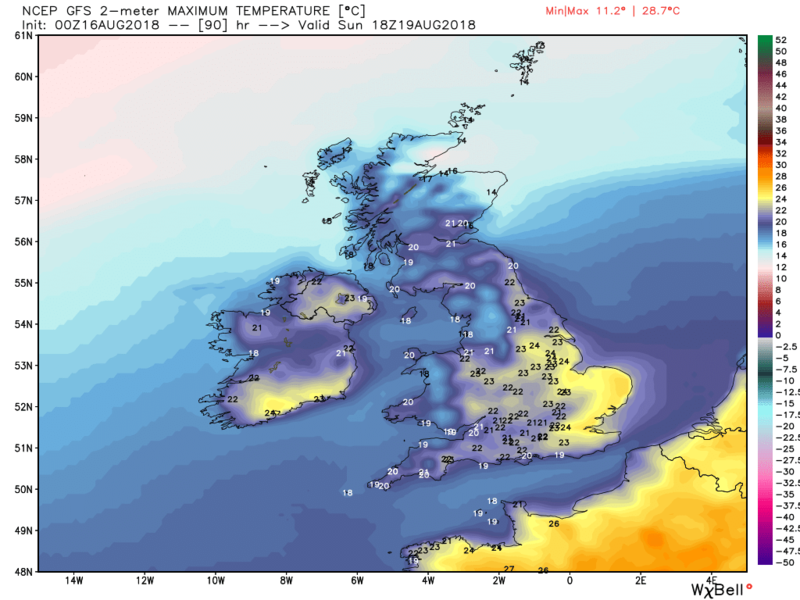 With Ernesto out of the way into the North Sea Sunday portends to be a warm and humid day in most areas with the noteable exception of northern Scotland. 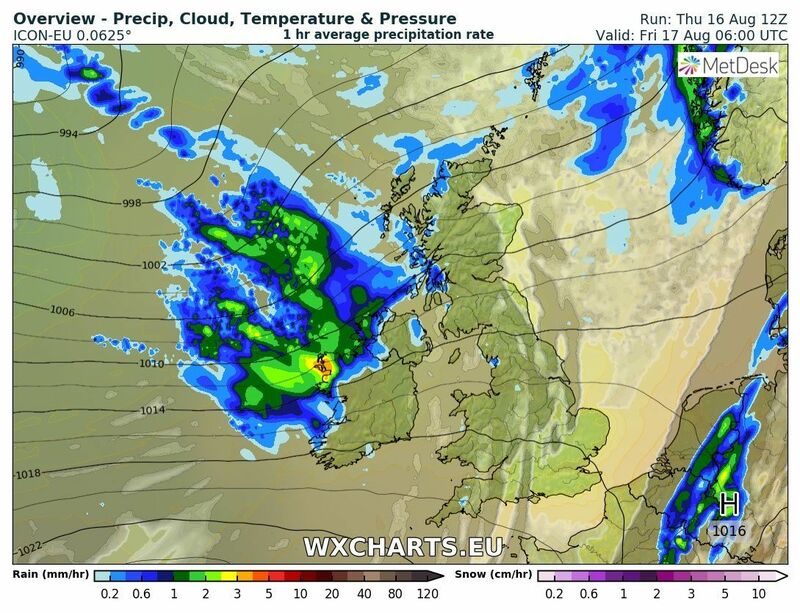 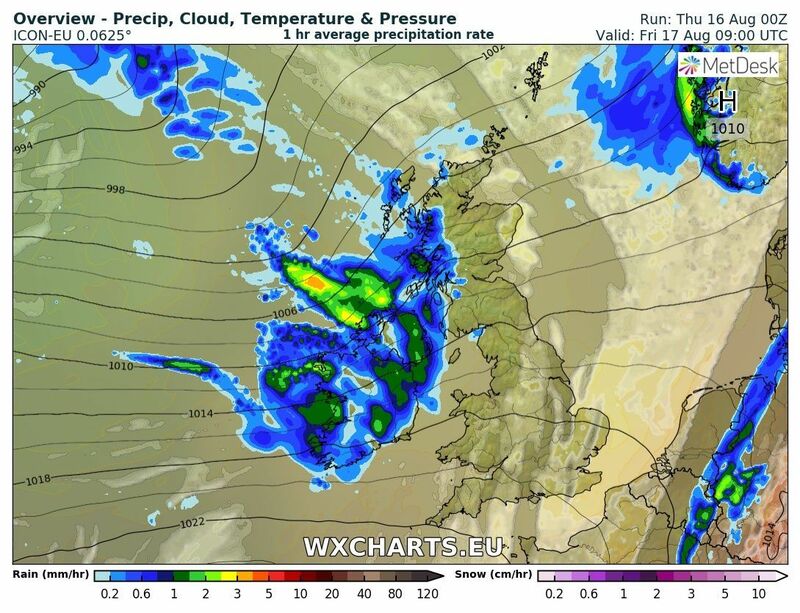 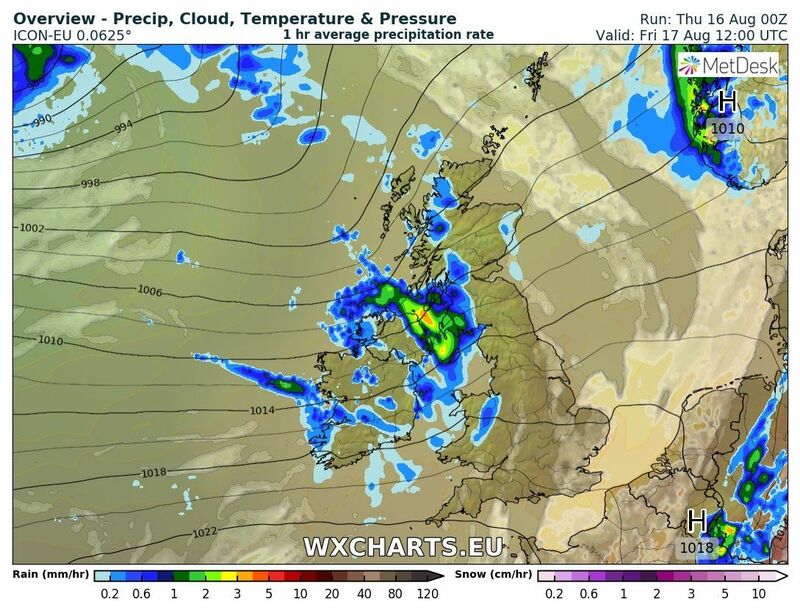 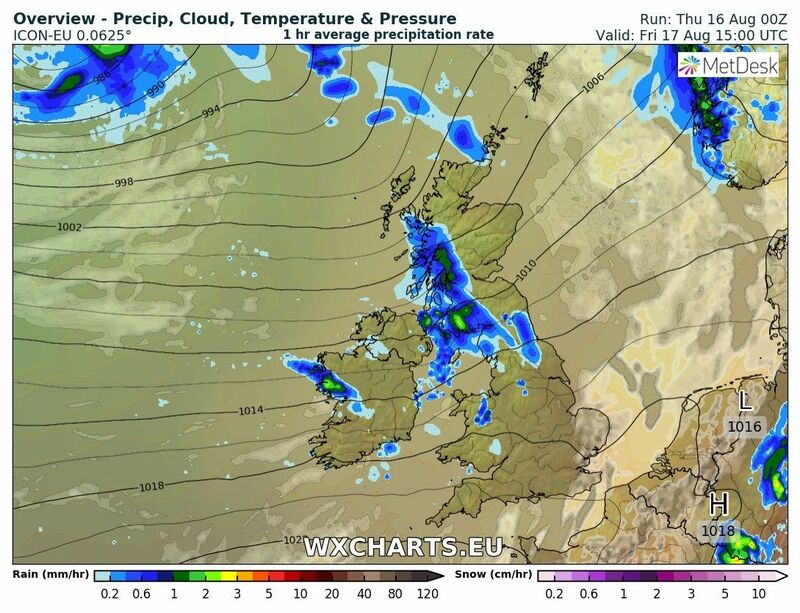 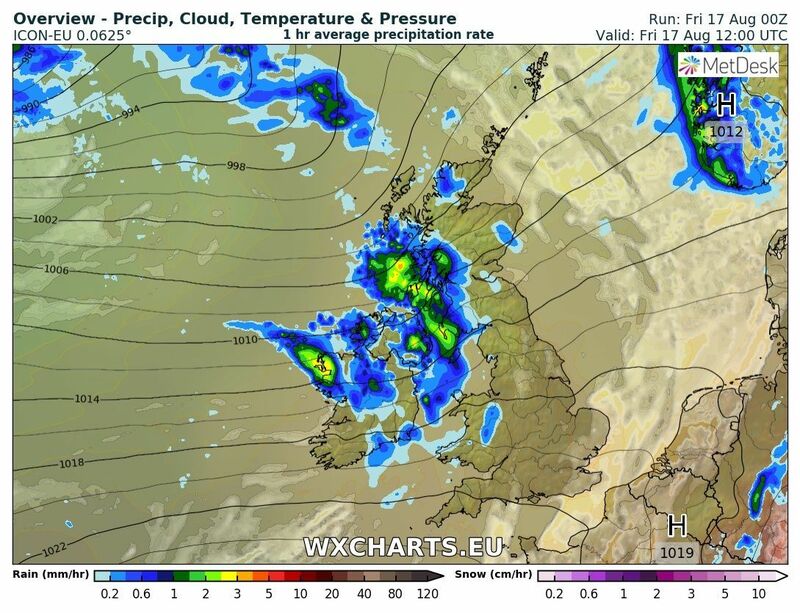 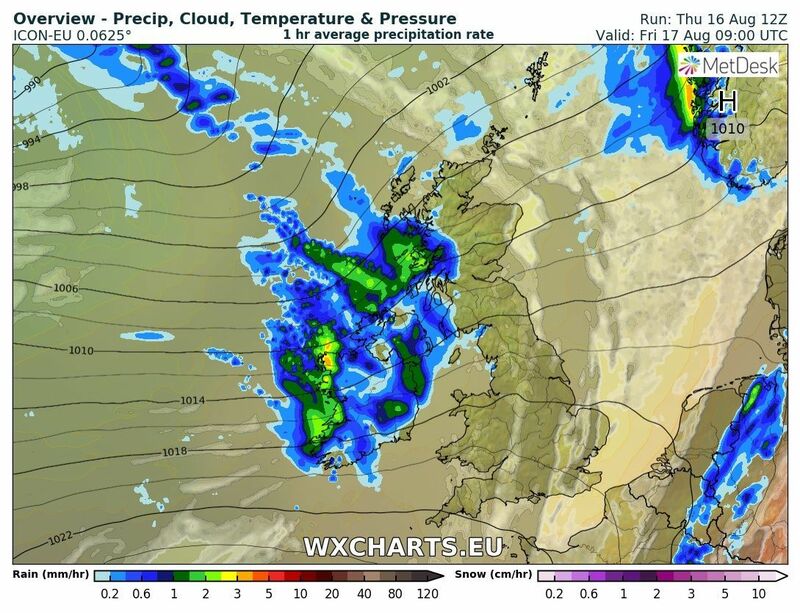 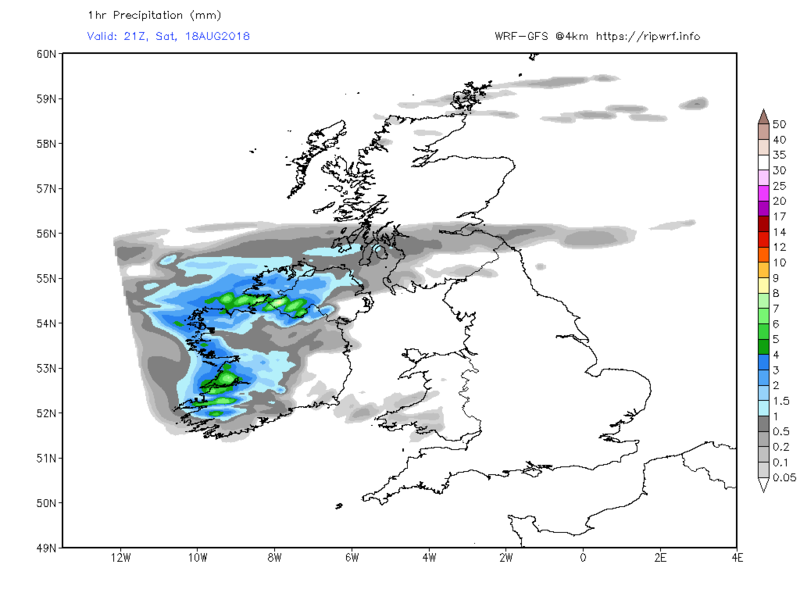 The front will clear the south east this evening leaving a mostly clear night for all but showers will persist across western Scotland at first before cloud and rain from the next frontal system will effect N.Ireland in the early hours on their way east. 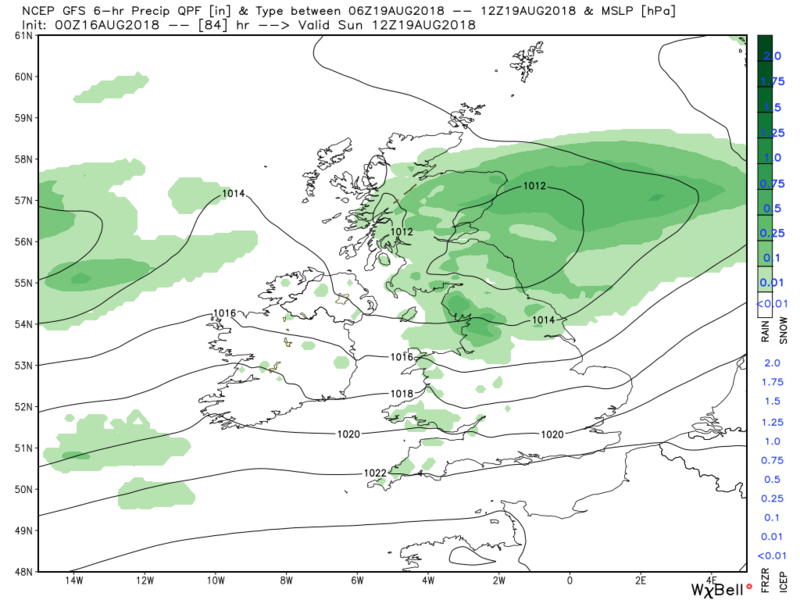 Very much the same scenario overnight and through Saturday, Clearer and windy in northern Scotland but tending cloudy in the rest of Scotland and northern England with the cold front trailing across the country out into the Atlantic where TS Ernesto has merged with another low. 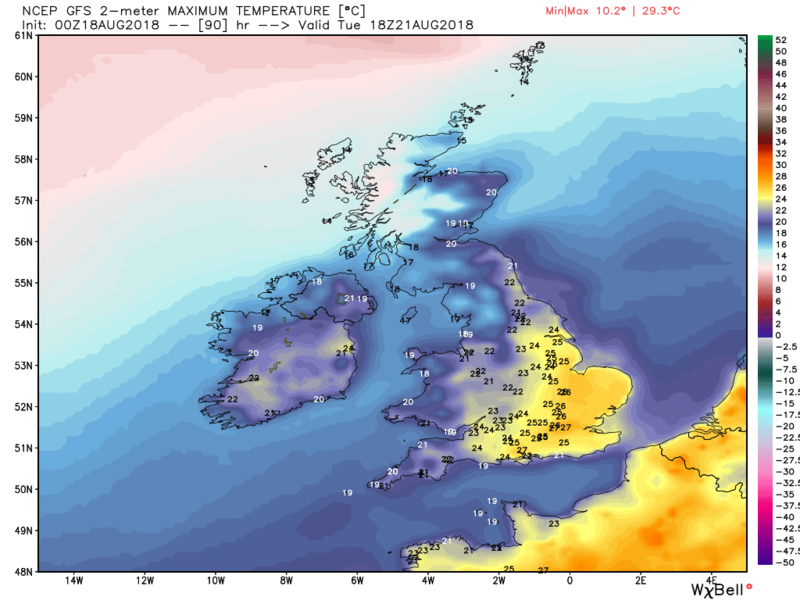 The rest of England and Wales are in a weakish warm sector where it will feel quite warm where the sun breaks through with possibly some intermittent rain/drizzle in the west. 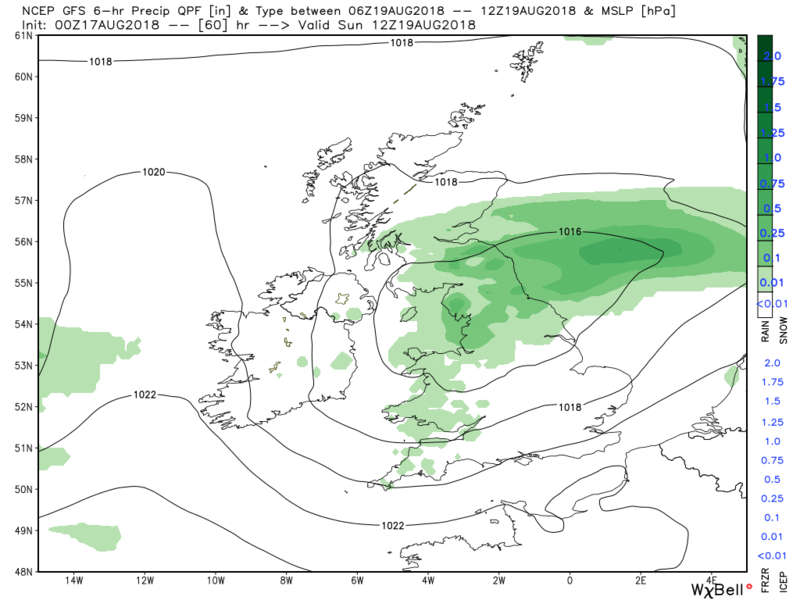 Overnight Saturday and through Sunday the waving front, including the remnants of Ernesto, track east to be over northern England by 1200 Sunday. 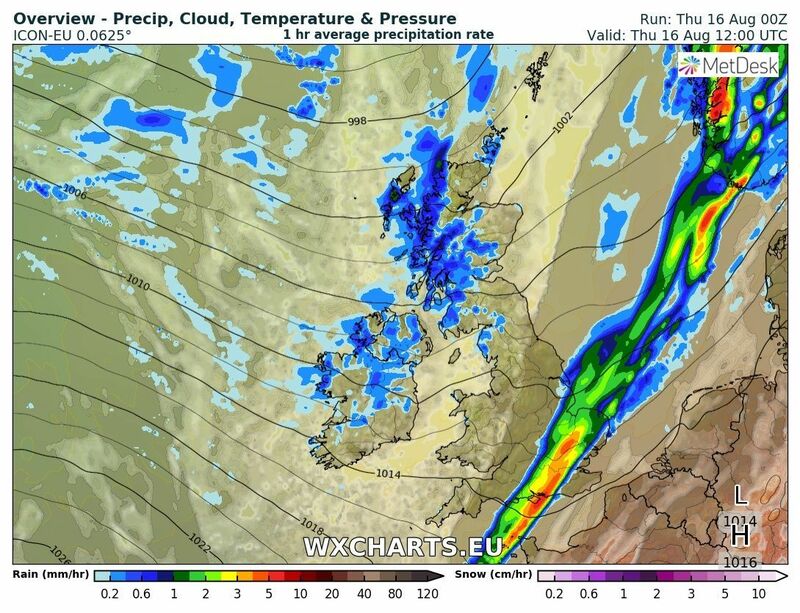 And the surface analysis with the rain concentrated in the north and again the very marked N/S temp contrast. 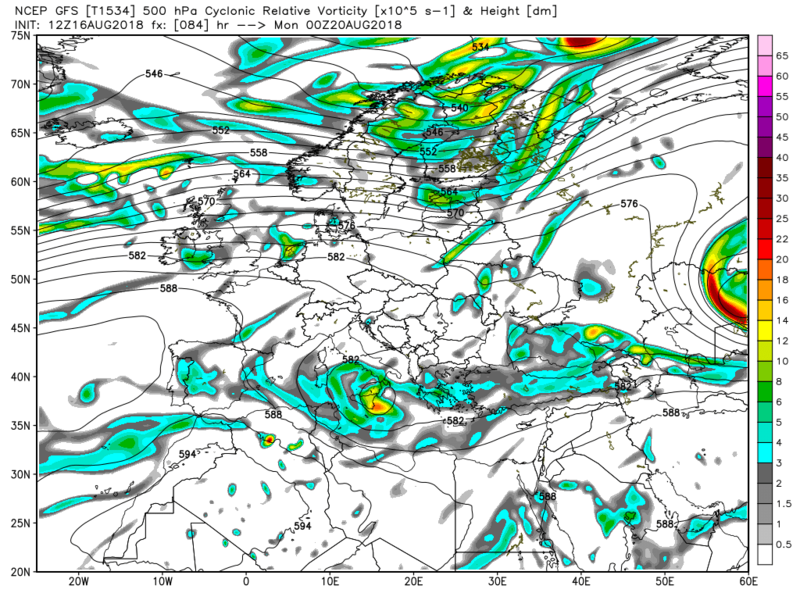 ERNESTO STILL A TROPICAL STORM BUT EXPECTED TO BECOME A POST-TROPICAL CYCLONE BY TONIGHT. 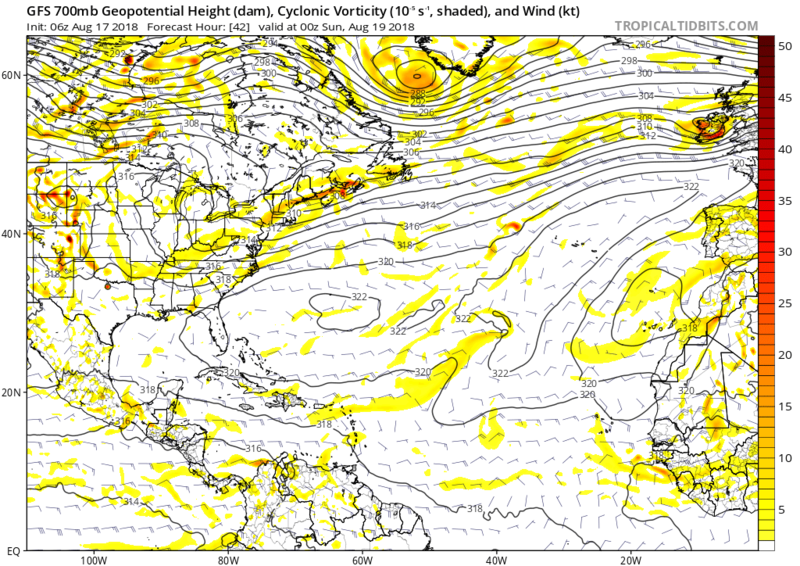 Definitely not a good idea creating a cut off upper low and then initiating an amplification of the Bermuda high pressure. 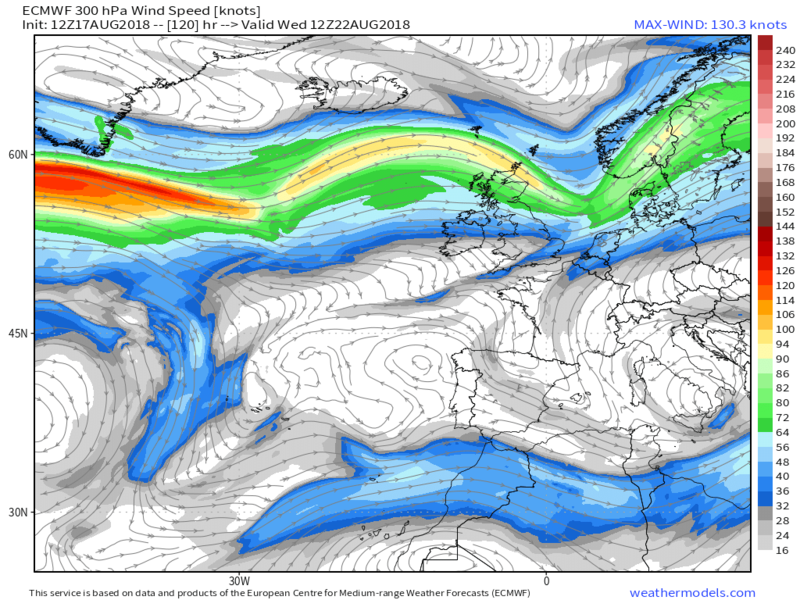 Well the ecm differs with the evolution of the Atlantic profile, vis cut off low and high amplification, as early as T84 so no cold plunge later. 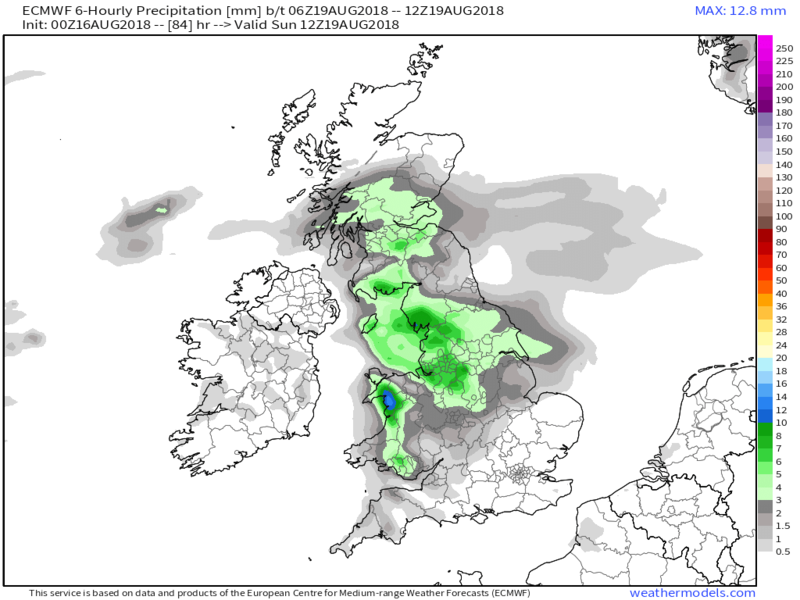 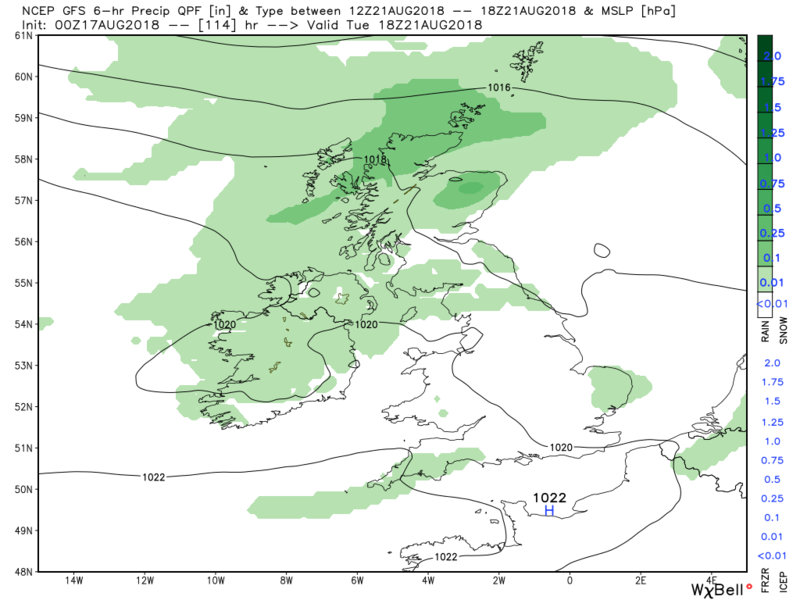 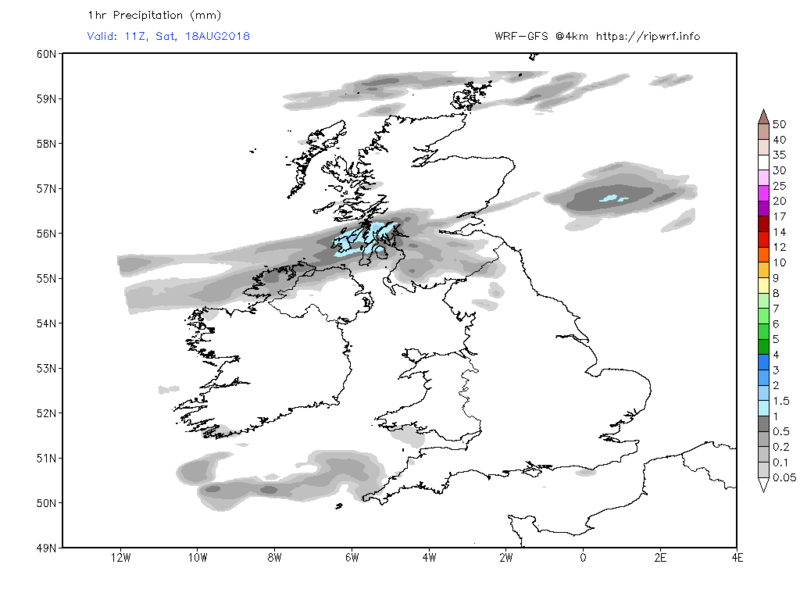 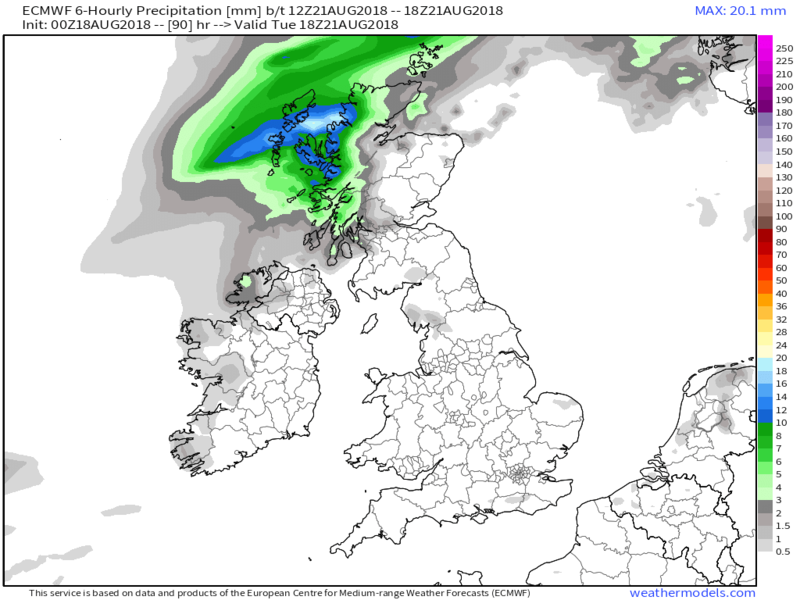 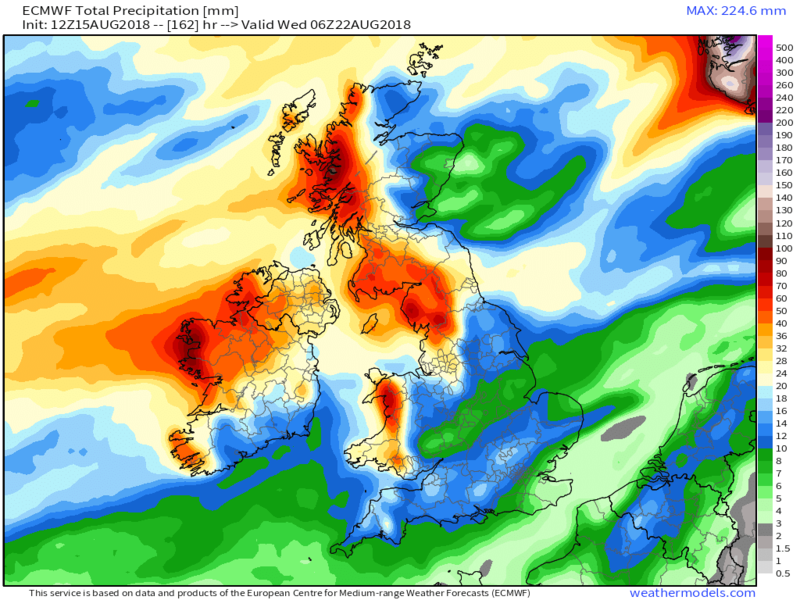 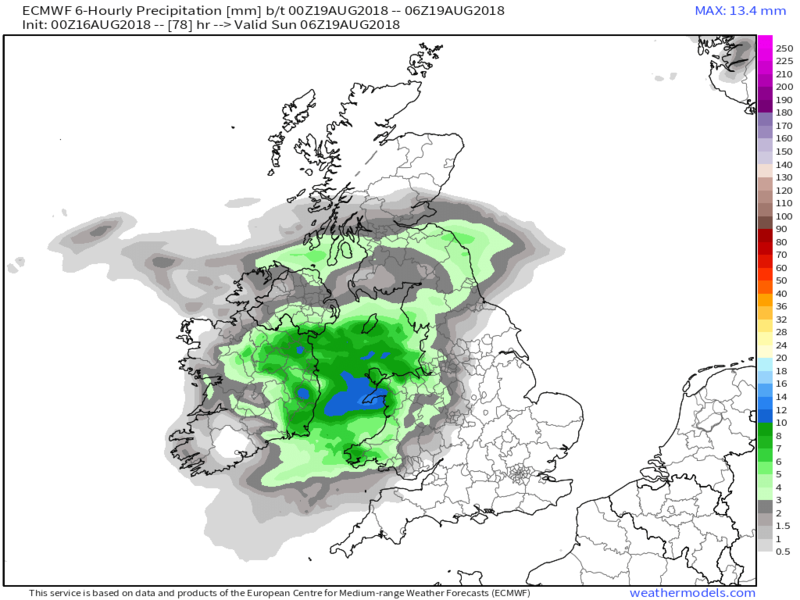 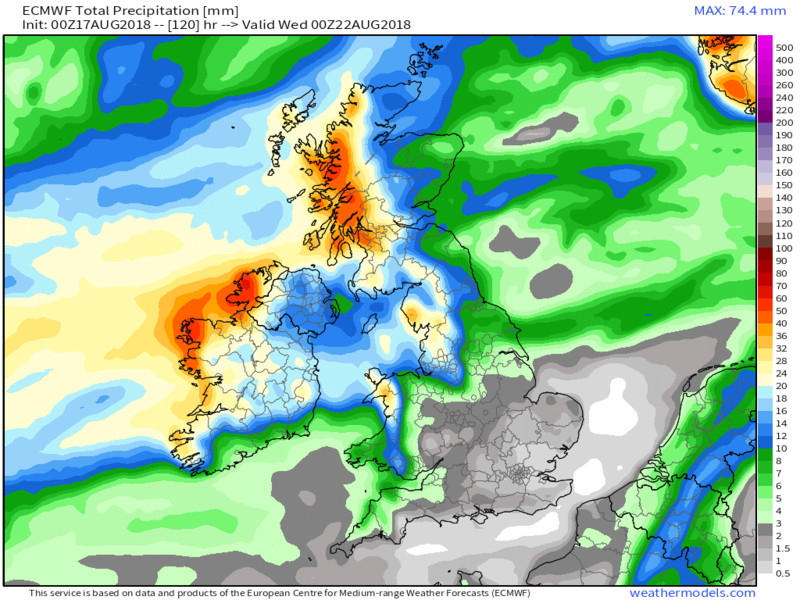 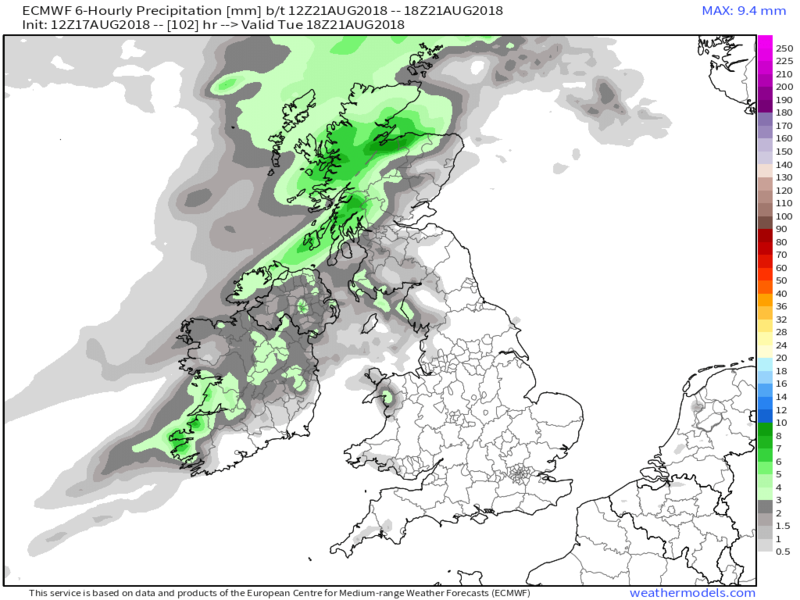 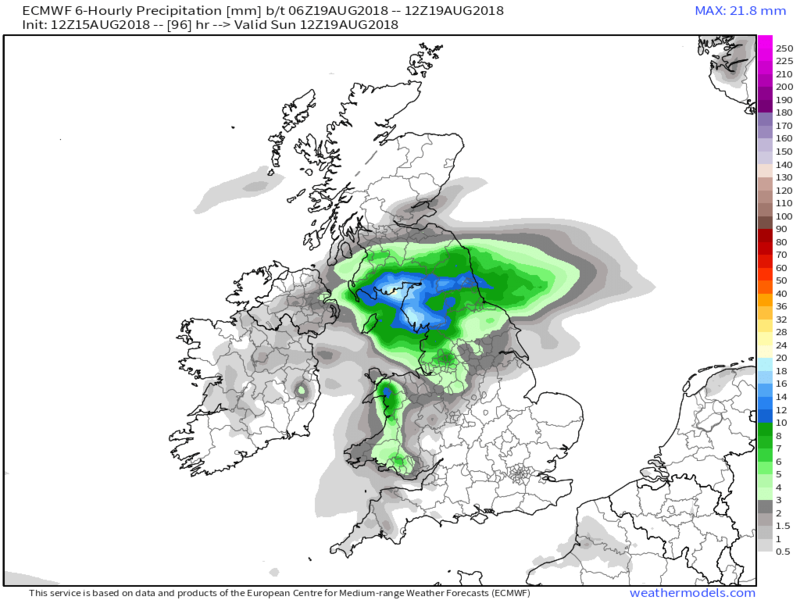 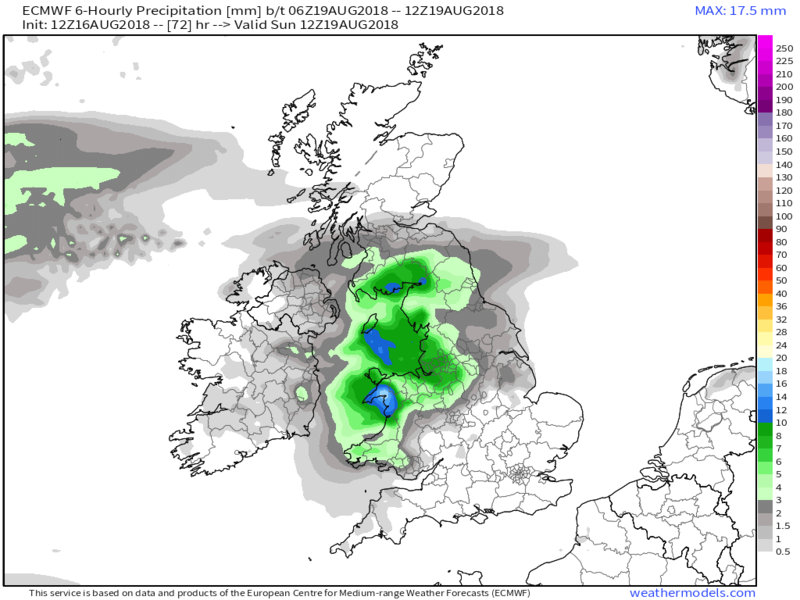 But still looking at it being wet over the north by 1200 Tuesday with the front orientated across Scotland and N. Ireland and down to the south west. 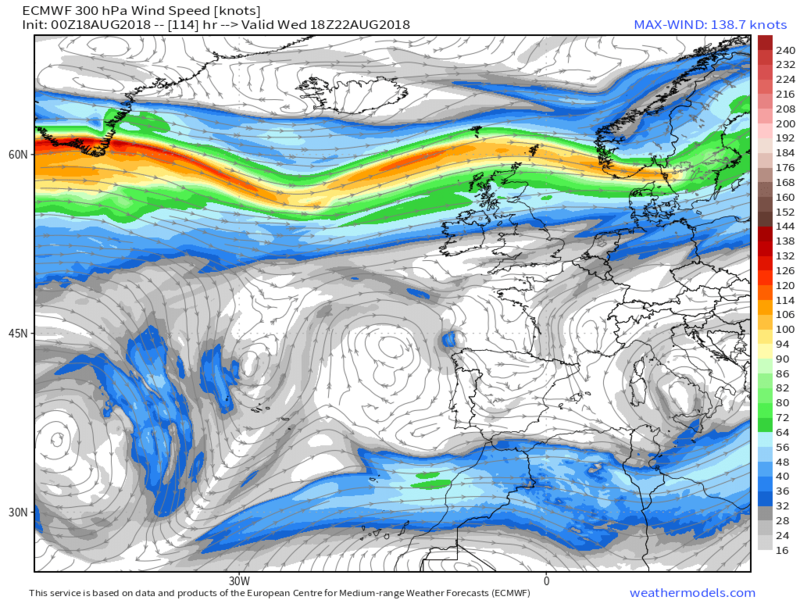 Over the next 18 hours it tracks south east but weakens as it hits the ridge and the main rain bey nips into southern Norway. 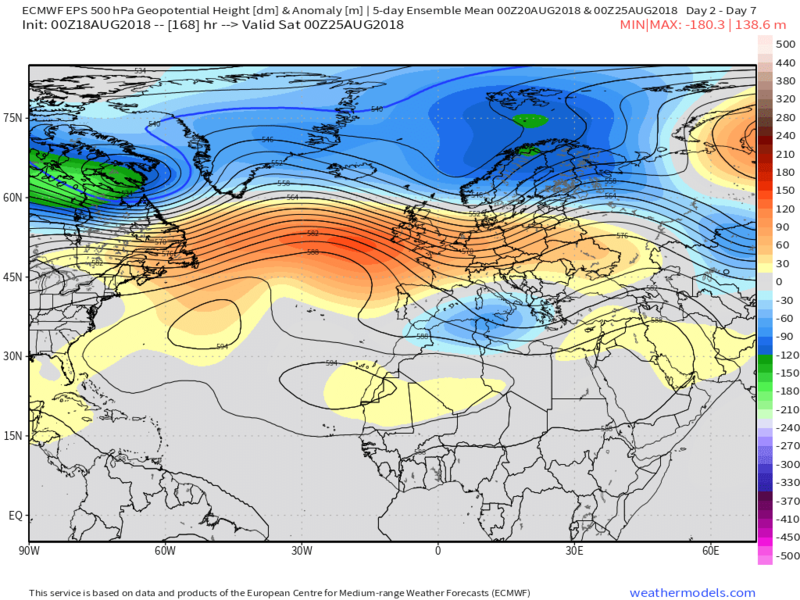 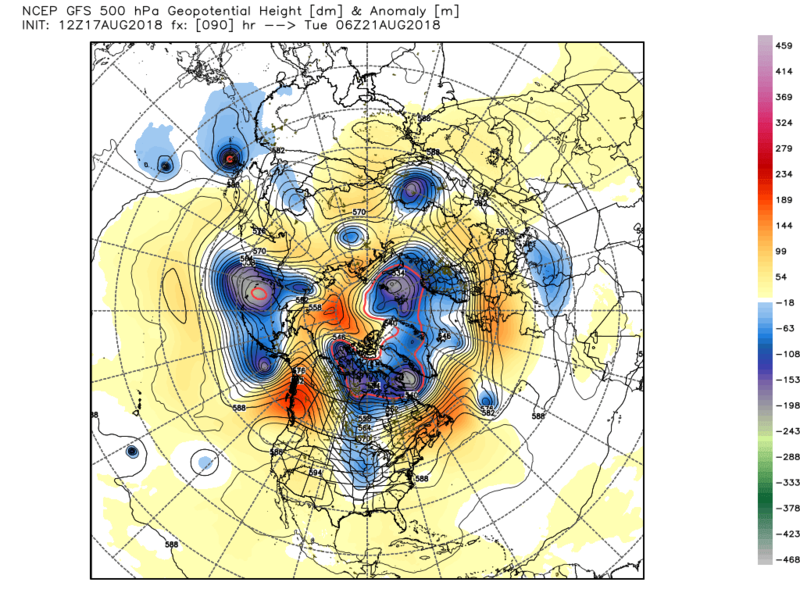 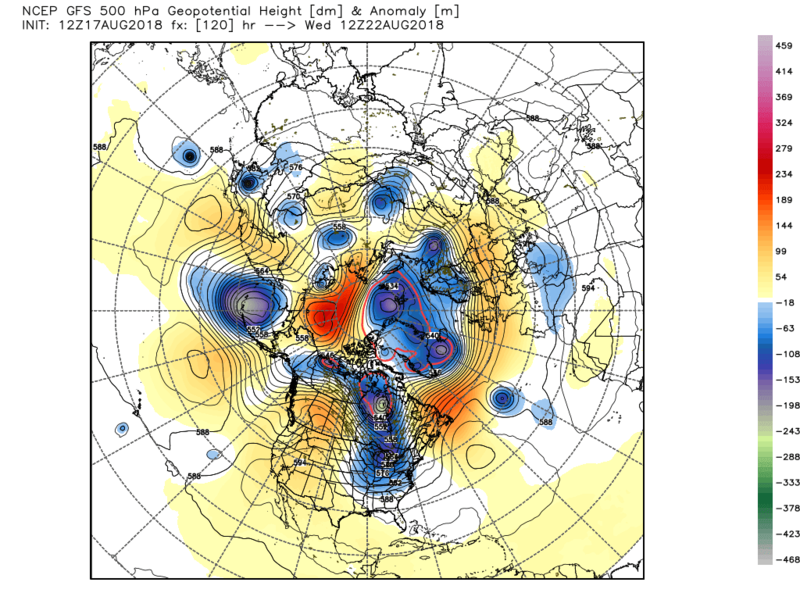 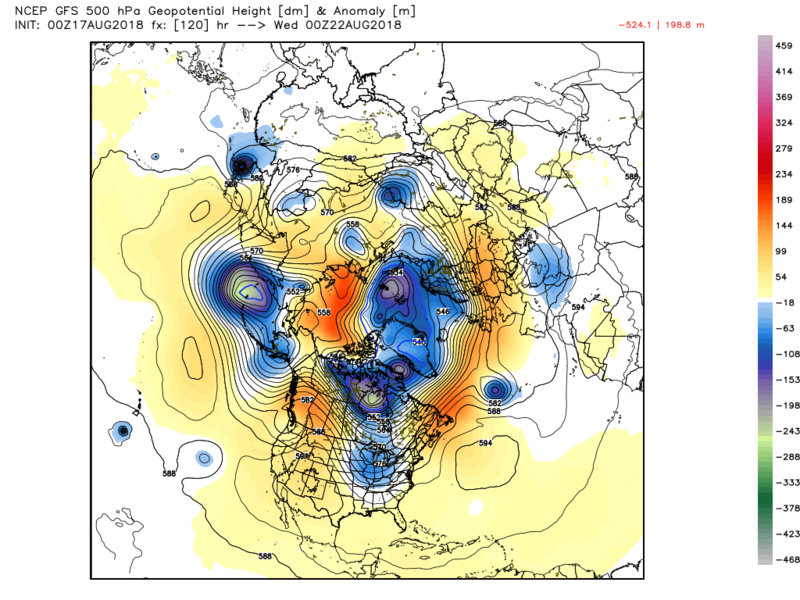 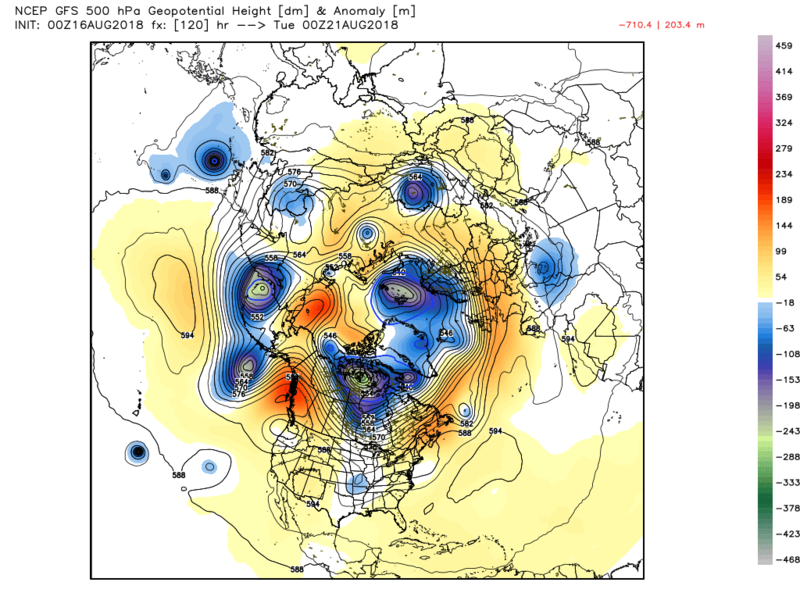 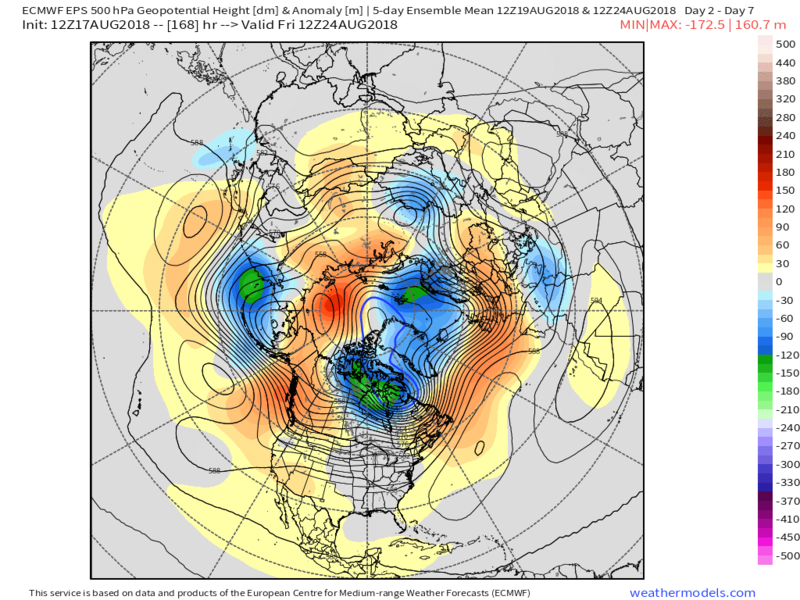 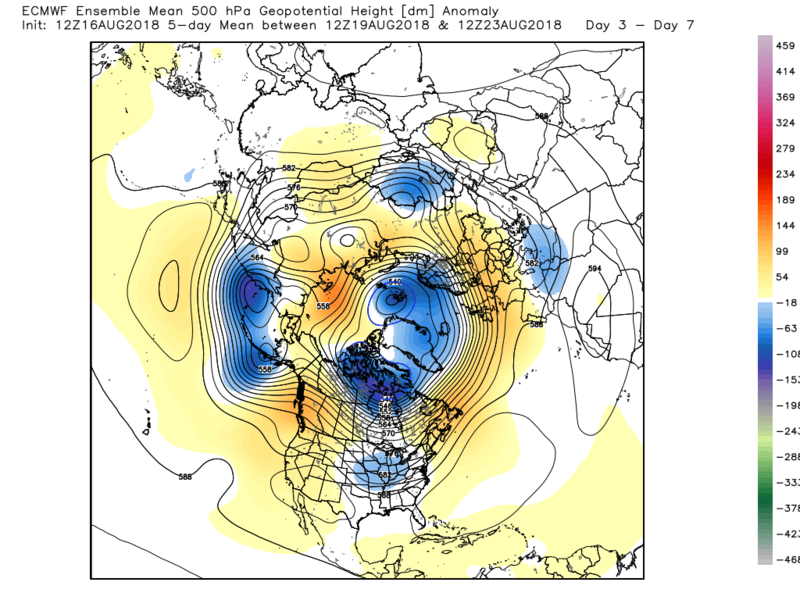 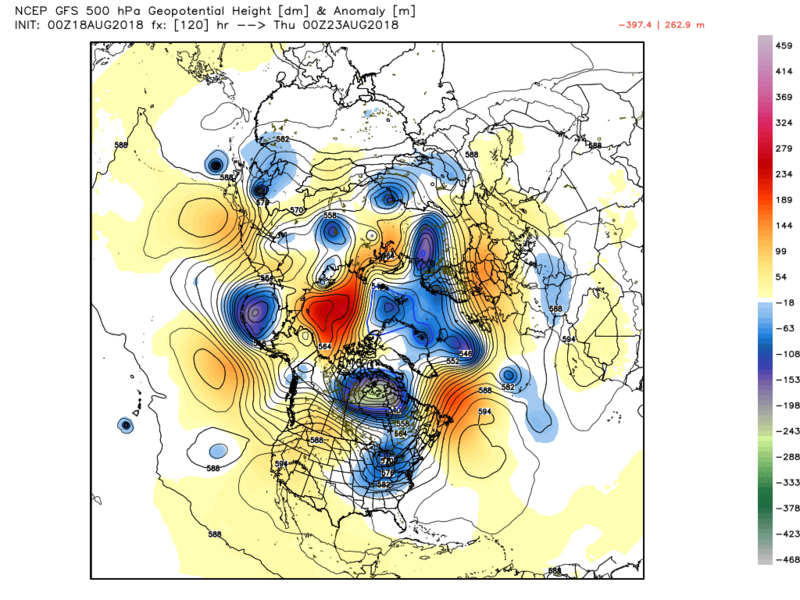 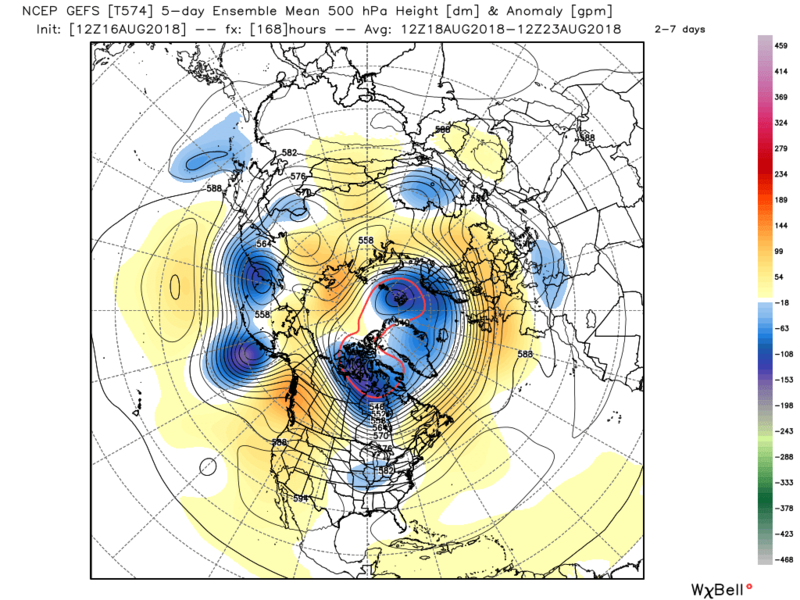 The was a suggestion on last night's short range anomalies of the sub tropical high pushing north in the Atlantic temporarily and if this is the case it would herald a brief interlude of cooler unsettled weather over the UK as the upper flow veers to the north west This would be just post the short range where there N/S split would generally still apply. 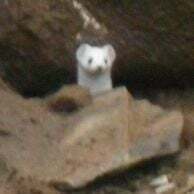 Back to the here and now. 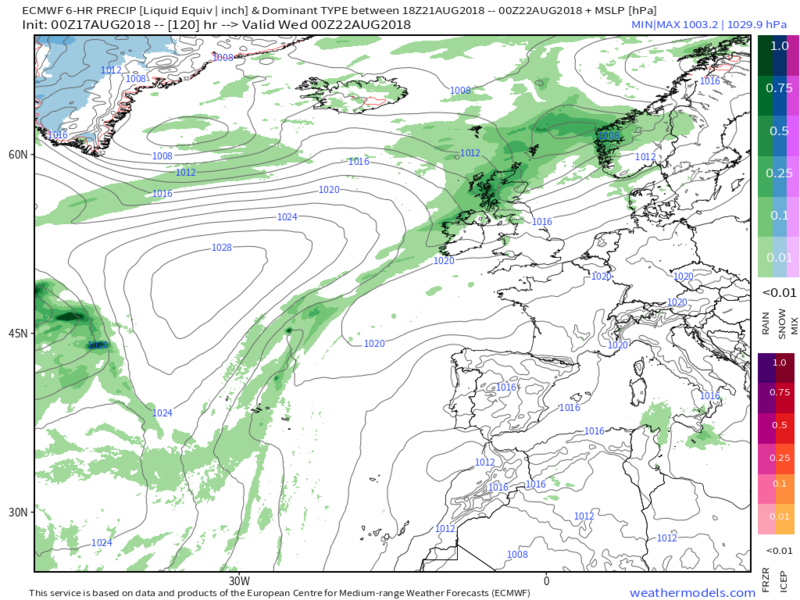 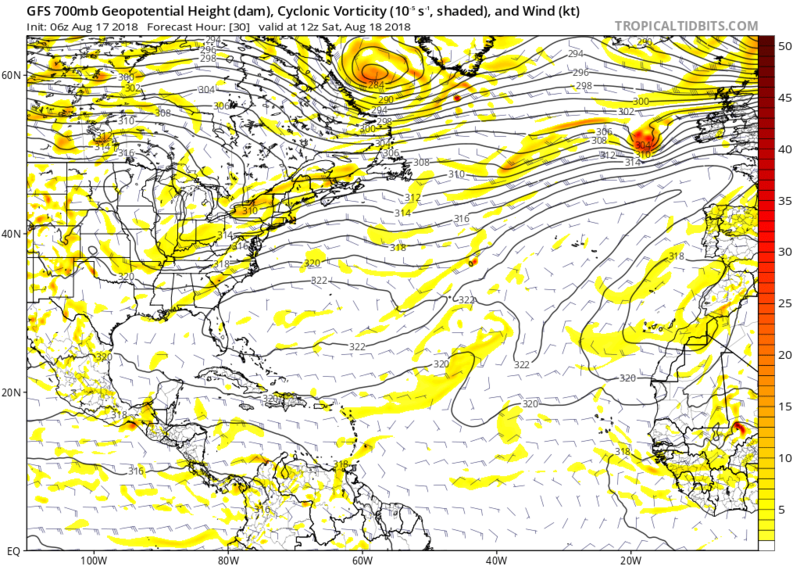 At midnight the upper trough to the north and associated surface low will remain influential over the weekend courtesy of a trailing front and associated systems, including Ernesto, approaching from the west. 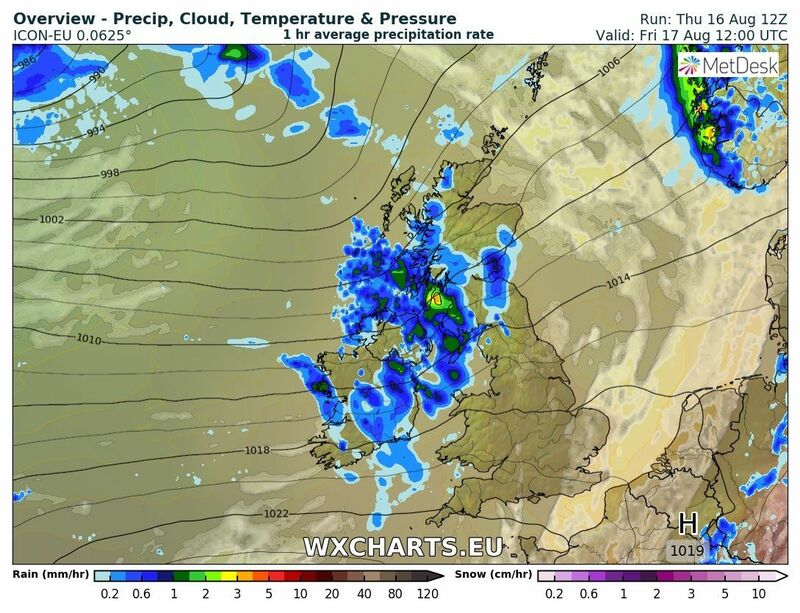 Today cloud and patchy rain/drizzle from the front will continue to effect N. Ireland, southern Scotland and north west England whilst northern Scotland will clear and be quite windy. 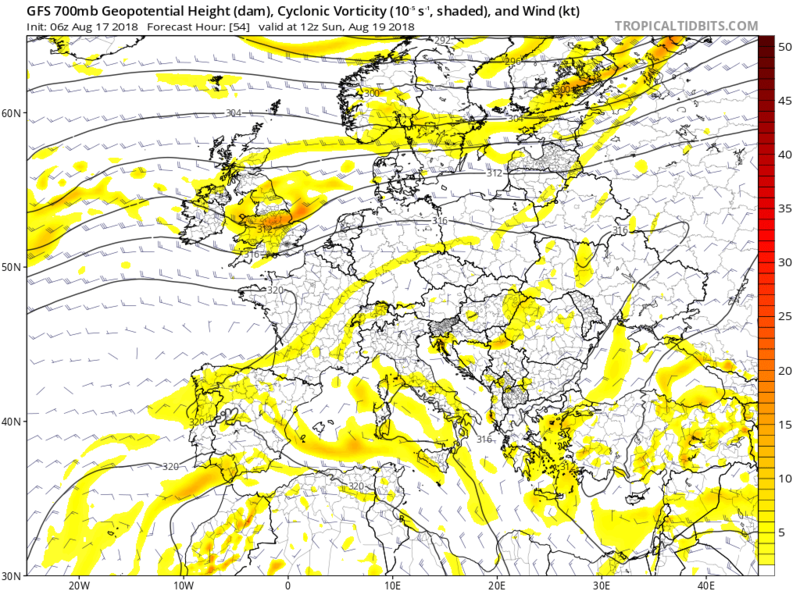 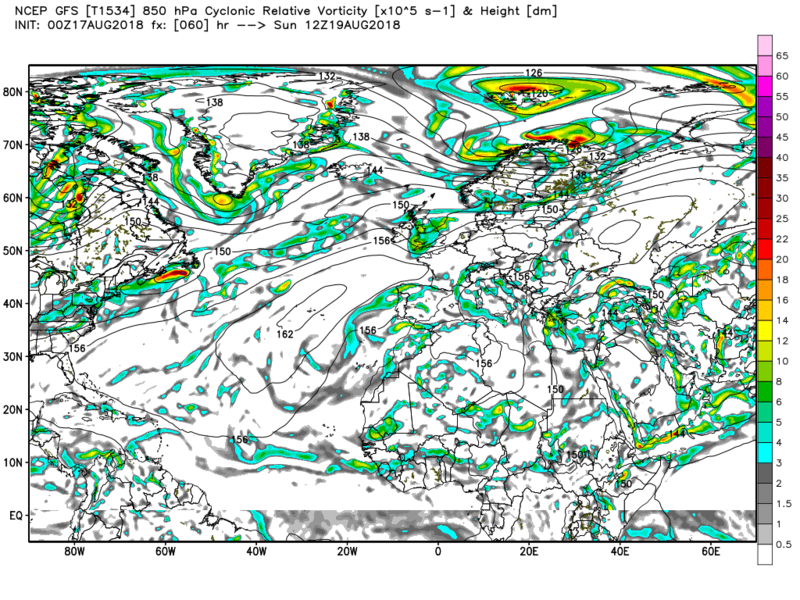 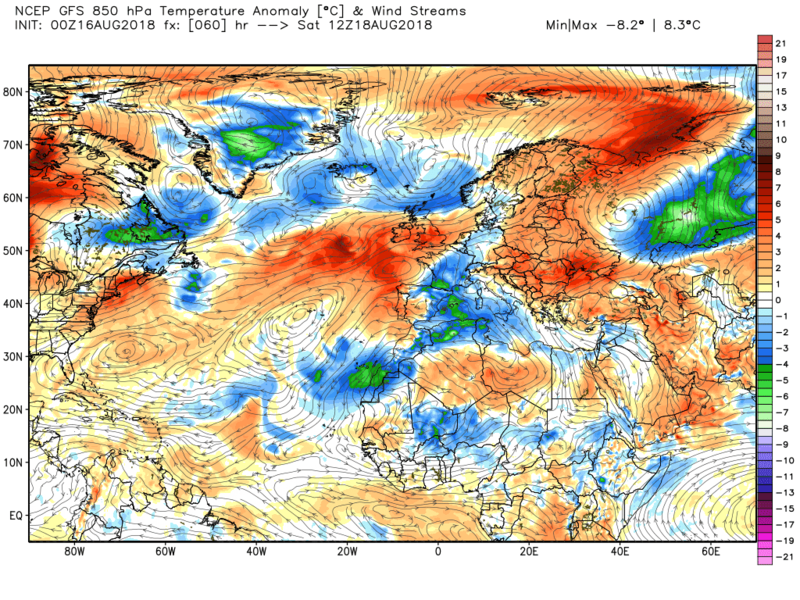 Further south far less cloud, apart maybe western coastal areas, and quite warm in the humid south westerly airstream. 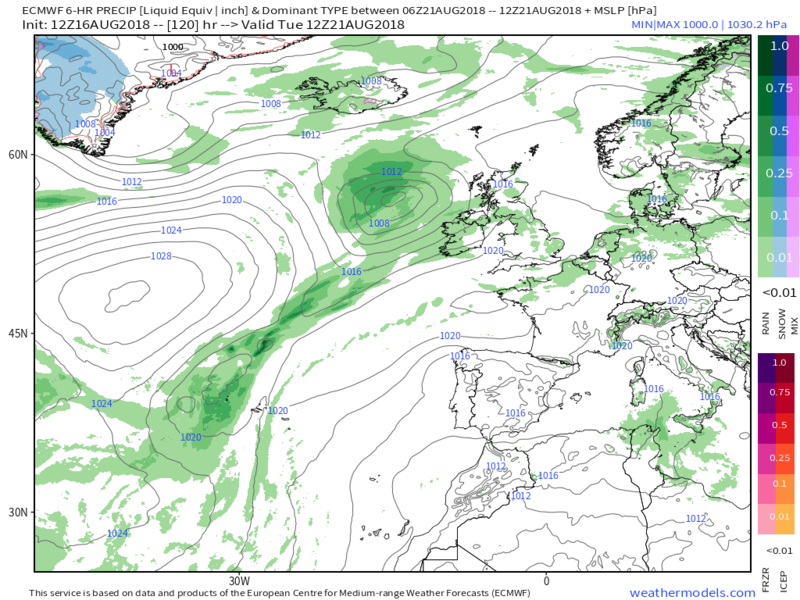 But as can be seen by 1800 Ernesto and the waving front are approaching western Ireland and the rain and moist tropical air associated with this will track across the country overnight and through Sunday morning before clearing into the North Sea. 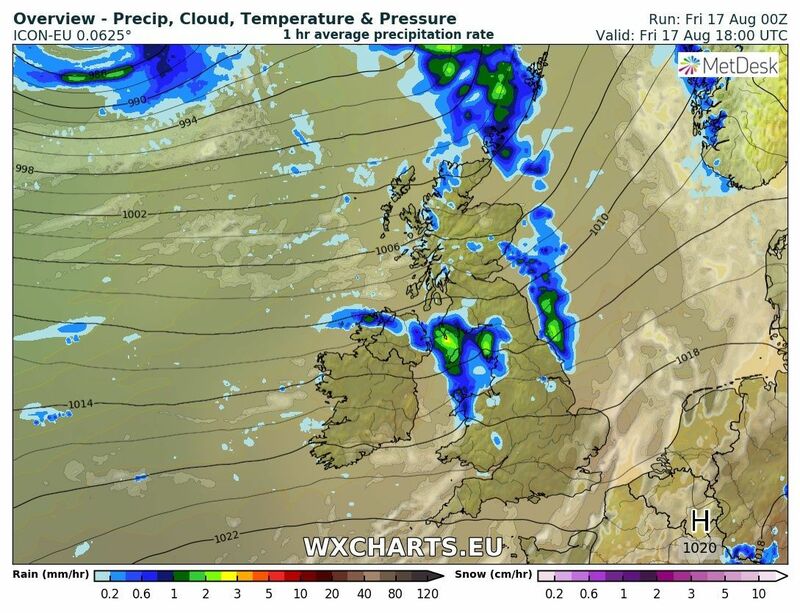 The rain, perhaps briefly heavy. 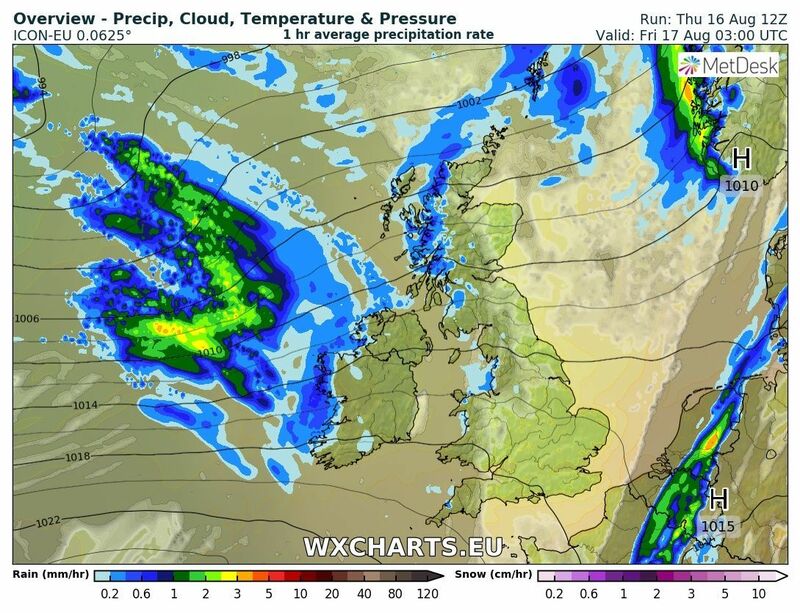 will mainly be concentrated over N. Ireland. 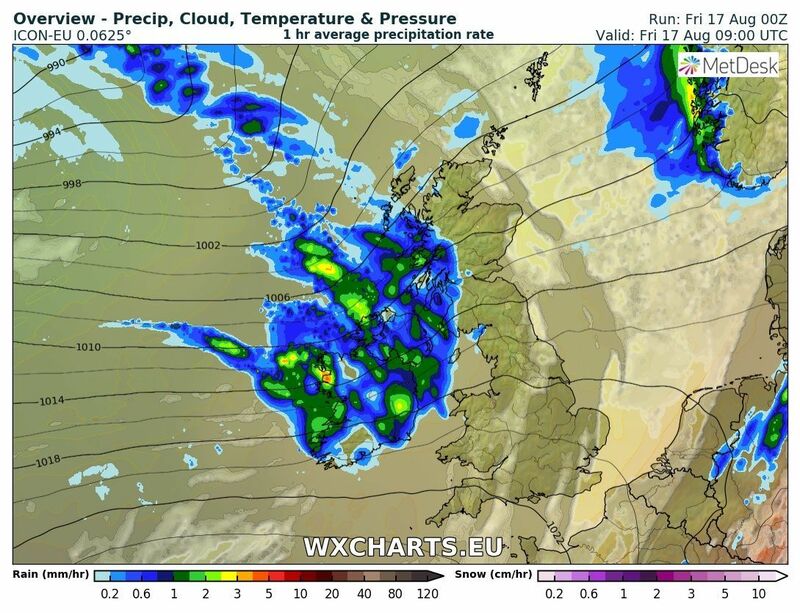 southern Scotland, and northern England and Wales and it will be quite windy in some places. 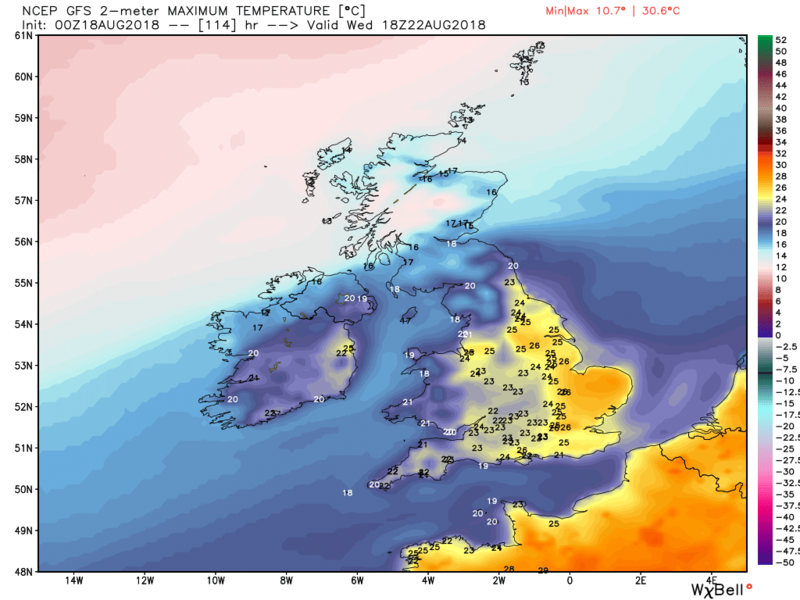 Mainly cloudy further south but tending warm and humid. 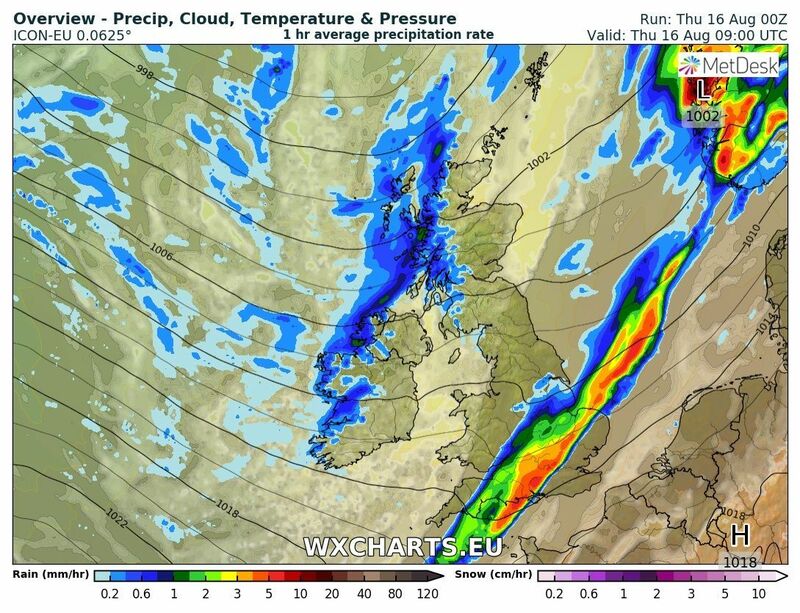 with the next wave and associated fronts approaching from the south west. 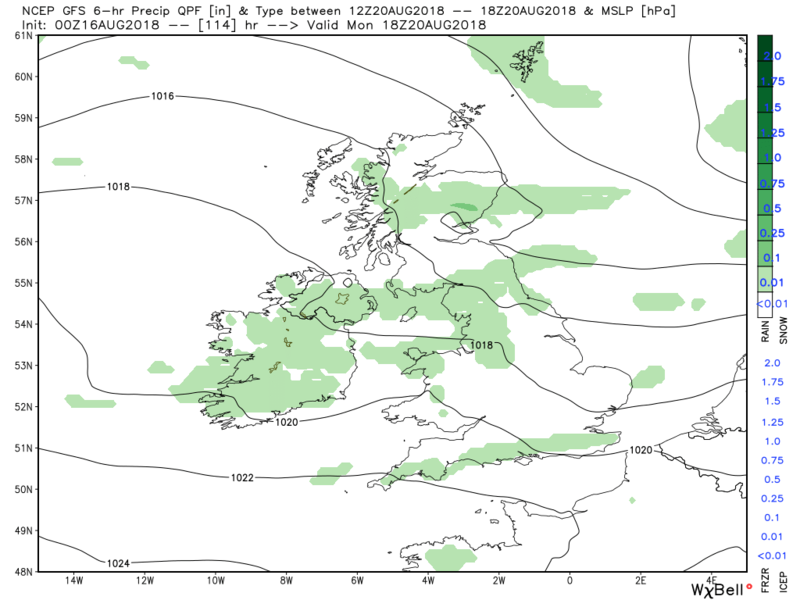 These track north east during the day bringing south patchy rain to northern areas but drier in the south and getting quite warm where the sun breaks through in the very broad warm sector. 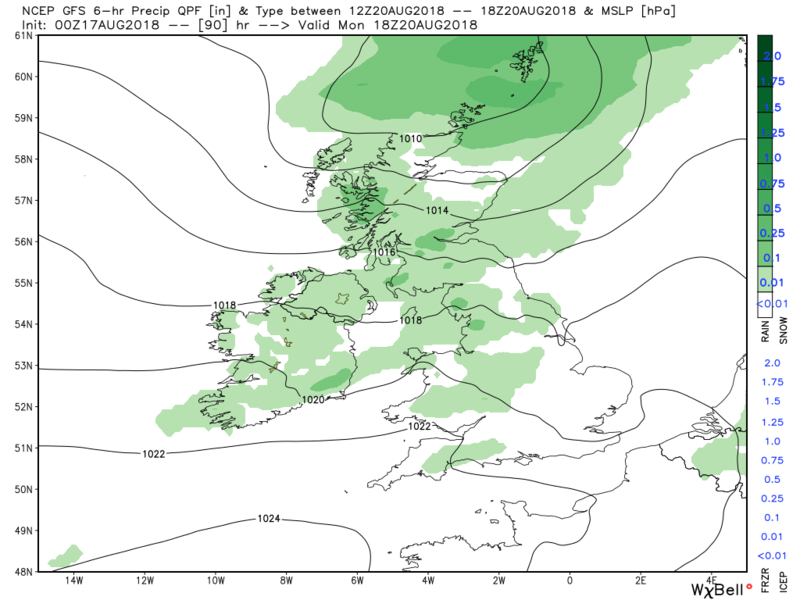 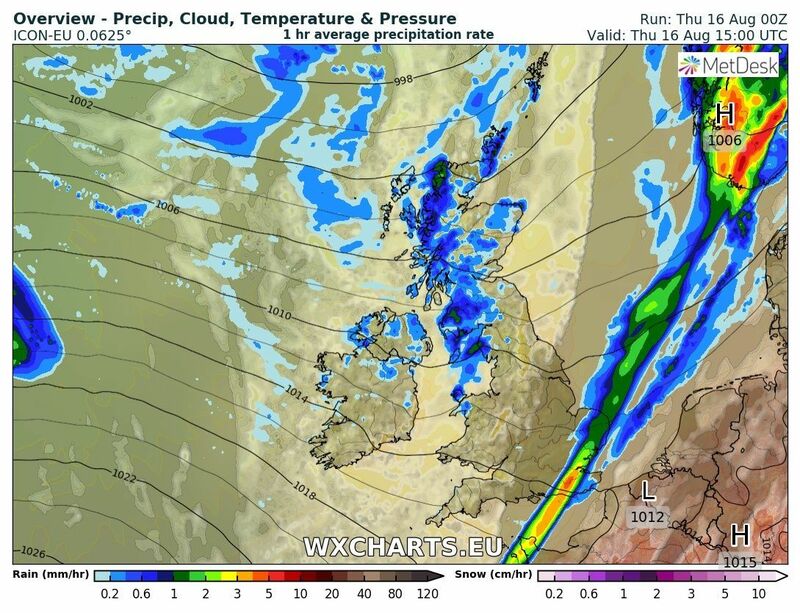 Overnight Tuesday and through Wednesday the next wave will track north east and it's the cold front associated with this that will bring cooler air generally as it tracks south east down the country accompanied by a belt of patchy rain. 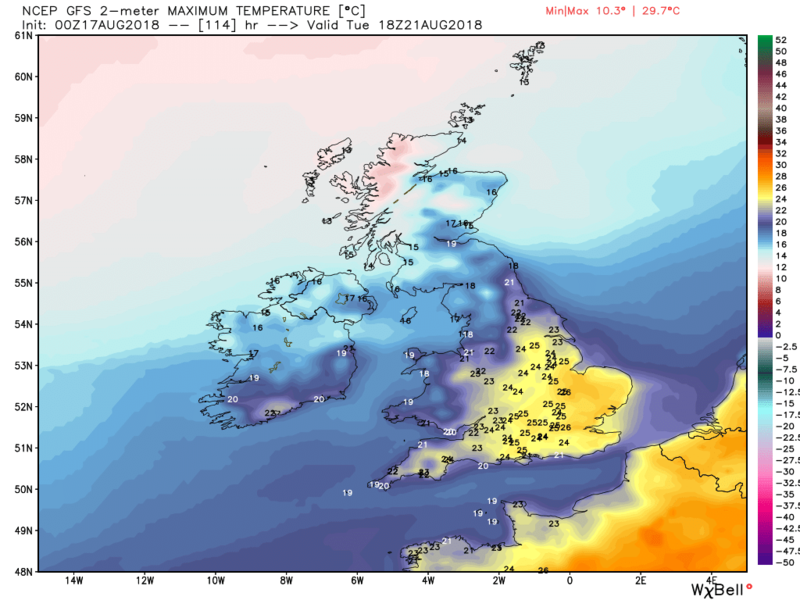 But before that, and south of the front, it will be another warm day. 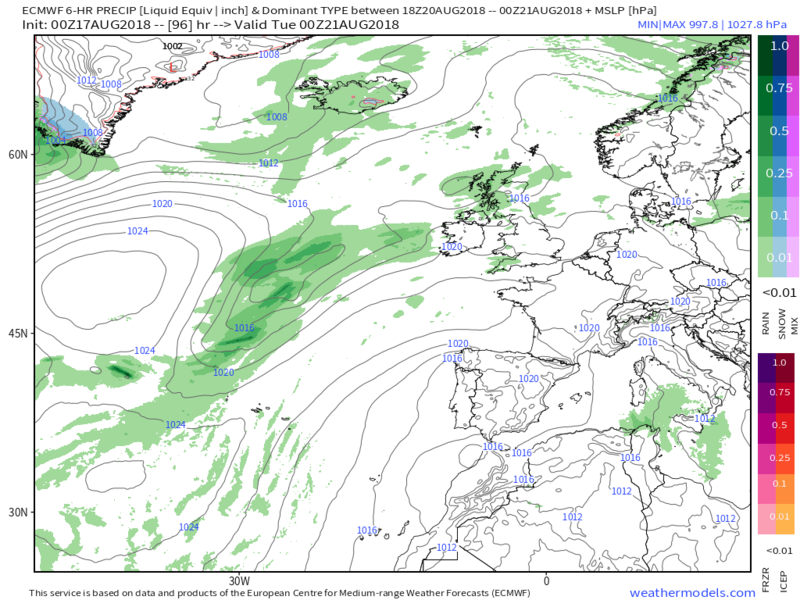 The ecm has the front and wave just west of the Hebrides at 12 Tuesday. 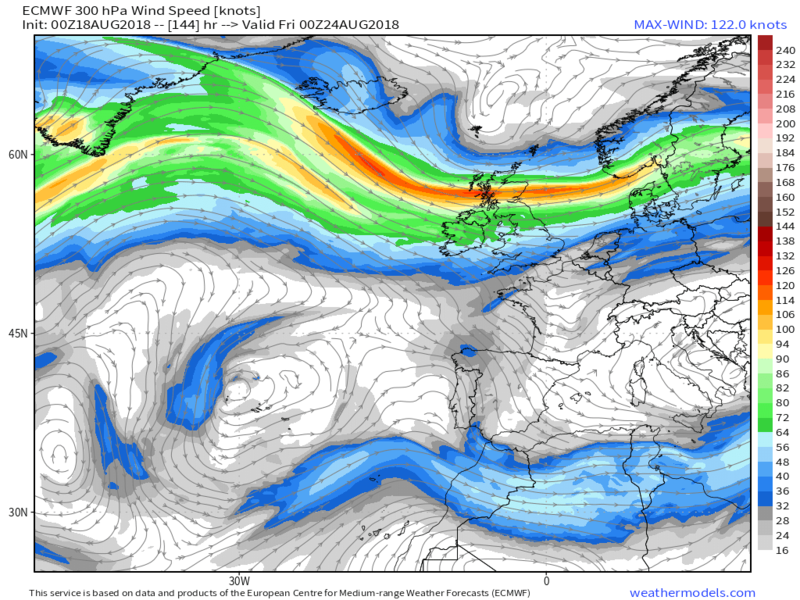 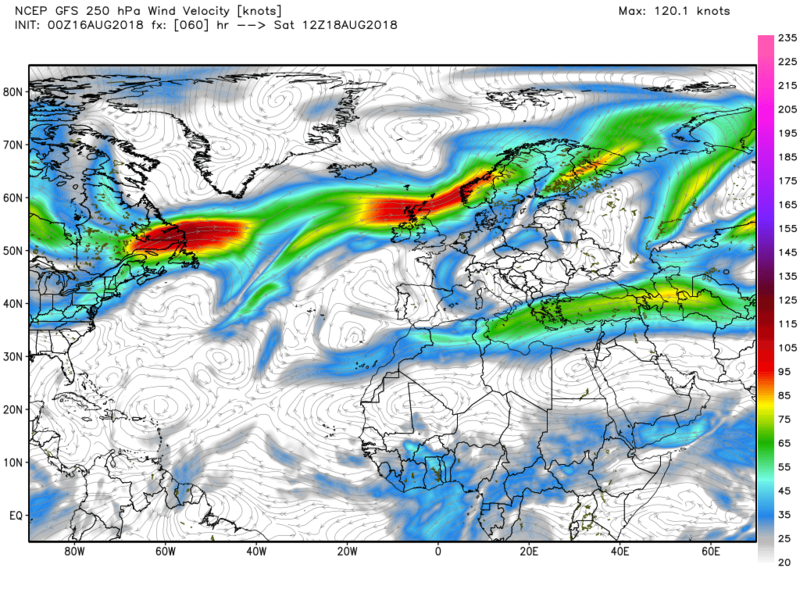 Over the next 18 hours it takes the wave and heavy rain east into southern Norway whilst tracking the rapidly weakening front south east down the UK.